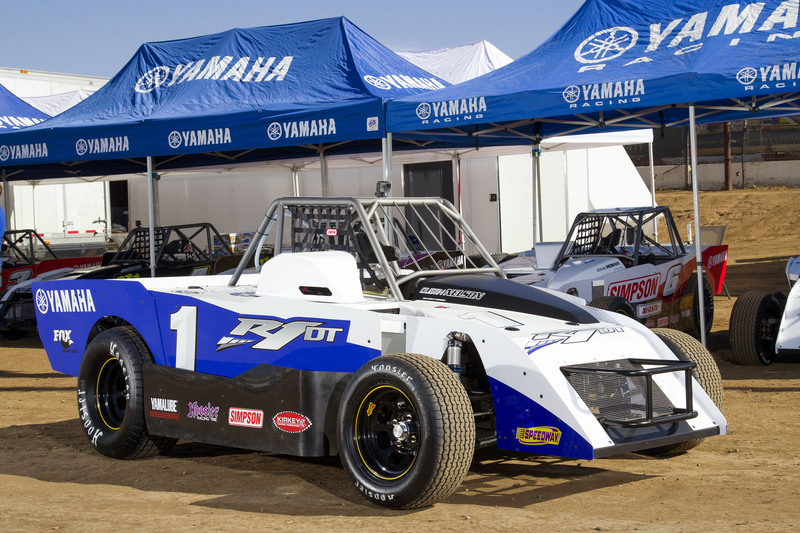 It’s not unusual to hear a Yamaha R1 engine screaming its cross-plane-crank howl down a racetrack, but it is odd to hear eight of them in chorus on a dirt-track course in cars. 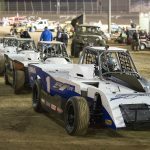 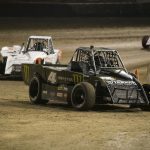 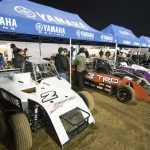 That was the combo of odd sights and sounds we witnessed at Perris Auto Speedway during an exhibition event at the Budweiser Oval Nationals sprint-car race on November 11. 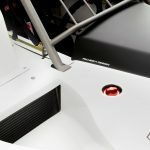 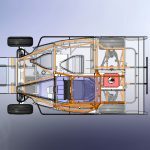 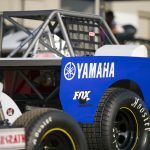 Yamaha provided not only the engines but also the cars themselves, tube-framed single-seaters that resemble a mash-up of a Modified dirt-track car and a Late Model class. 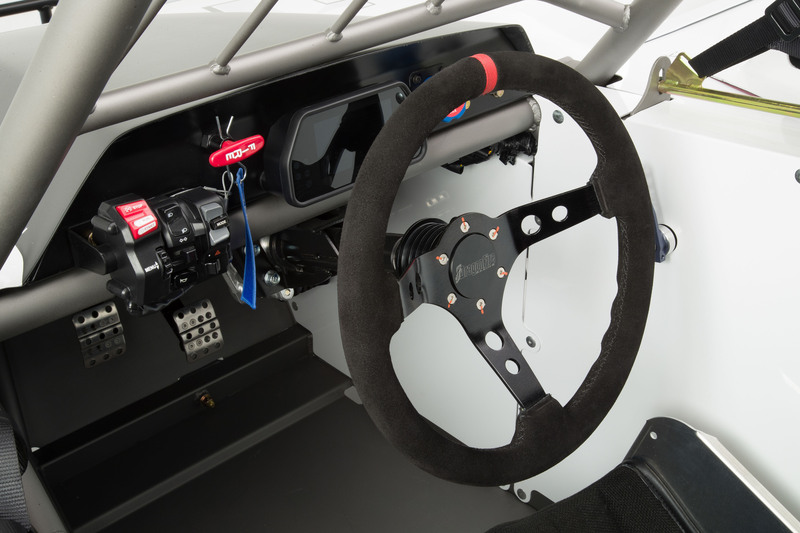 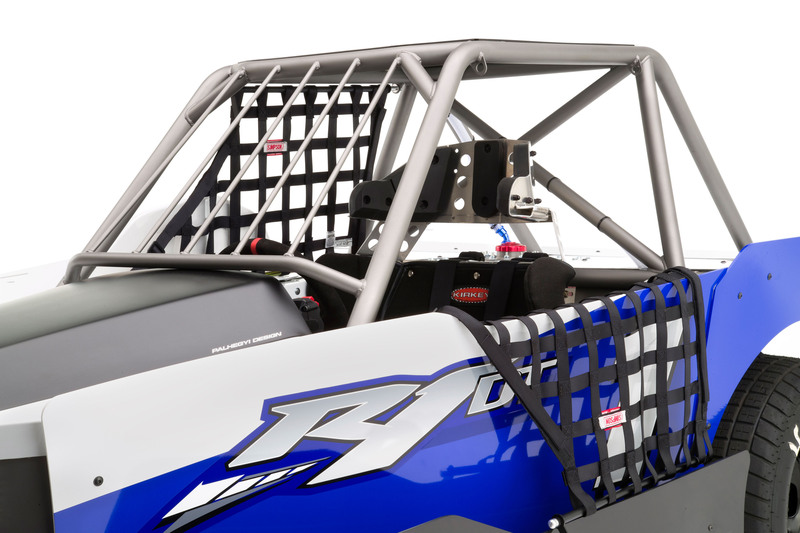 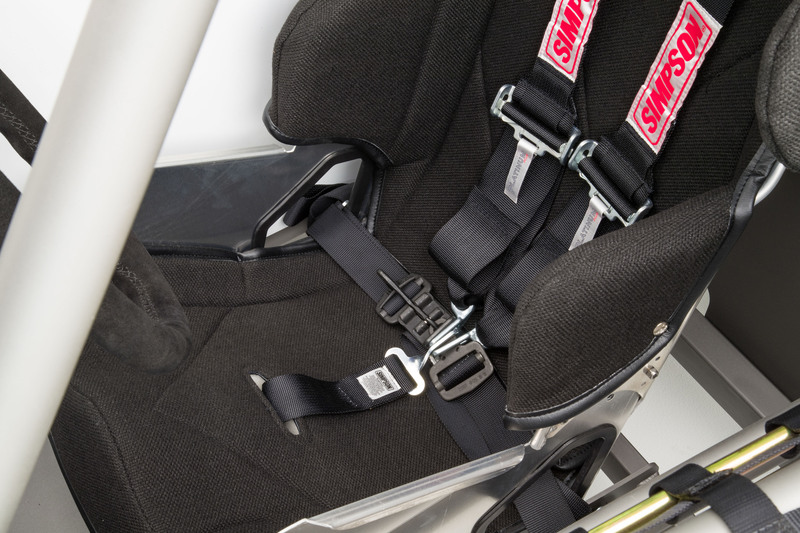 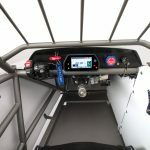 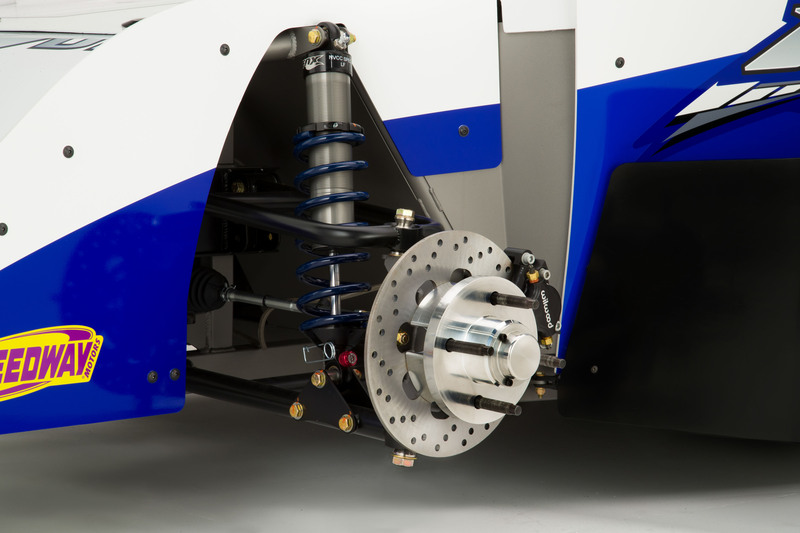 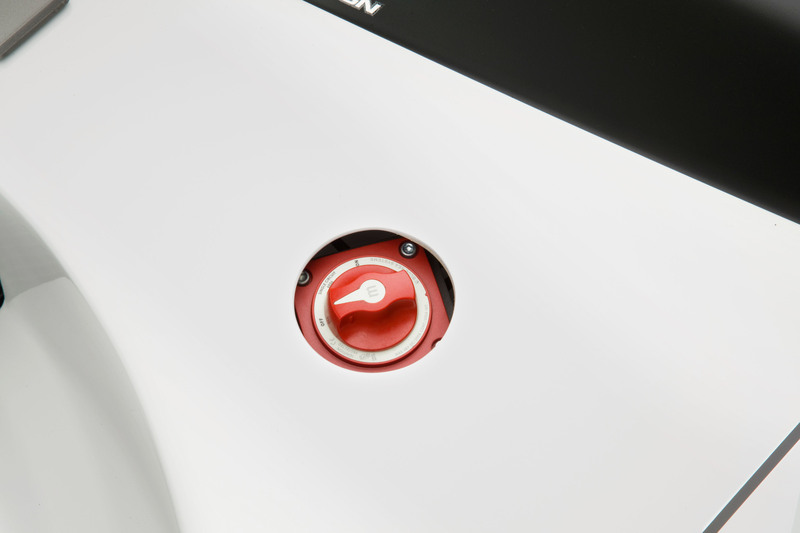 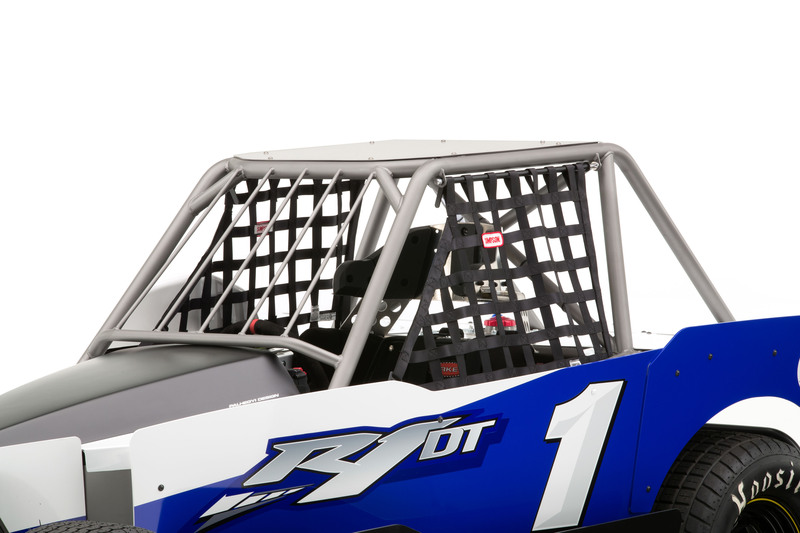 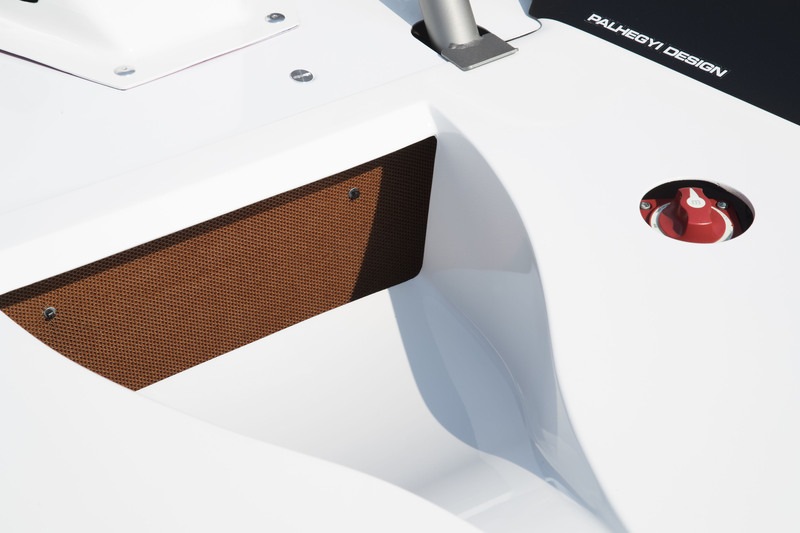 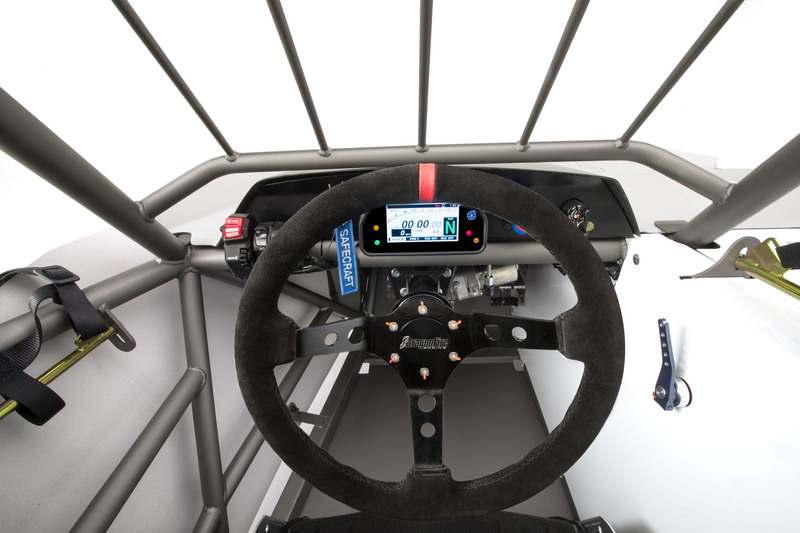 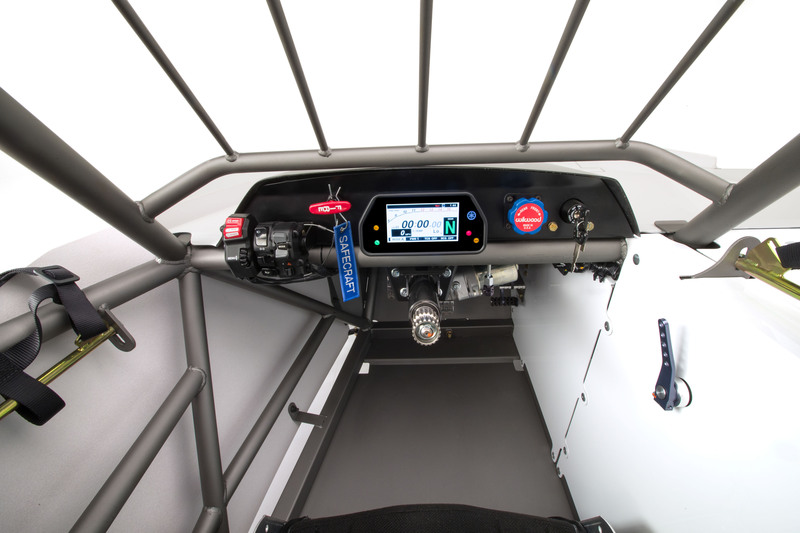 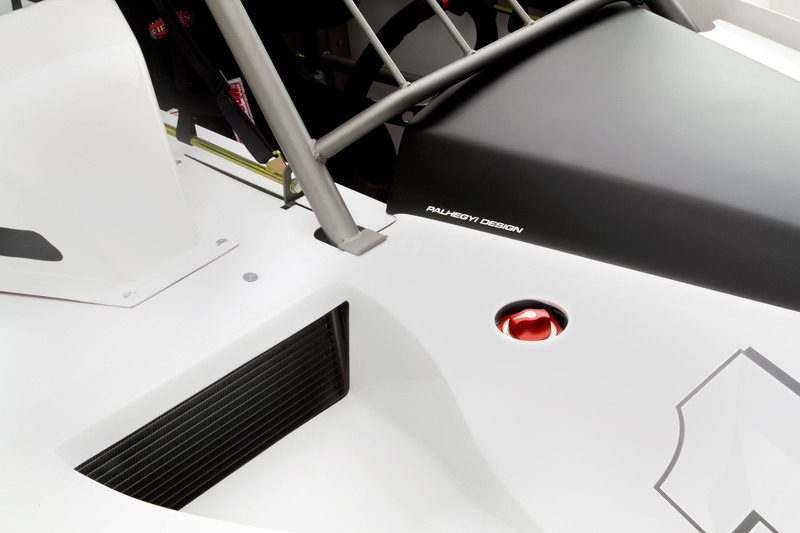 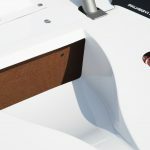 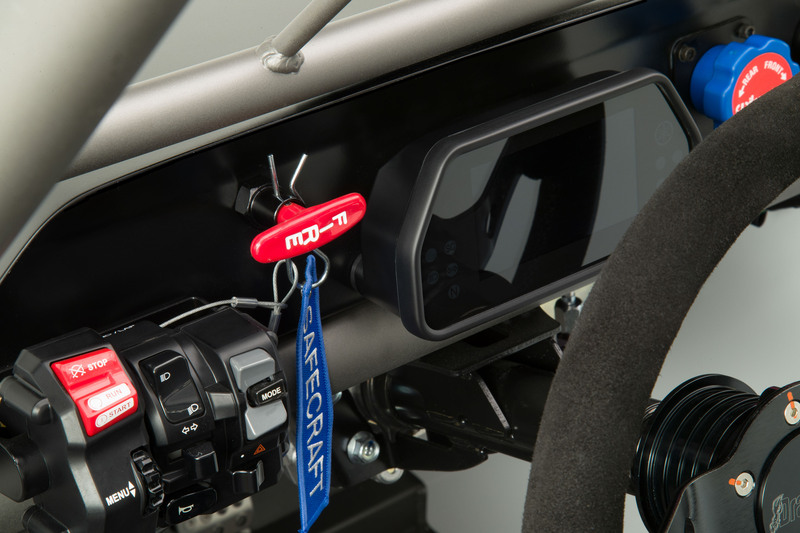 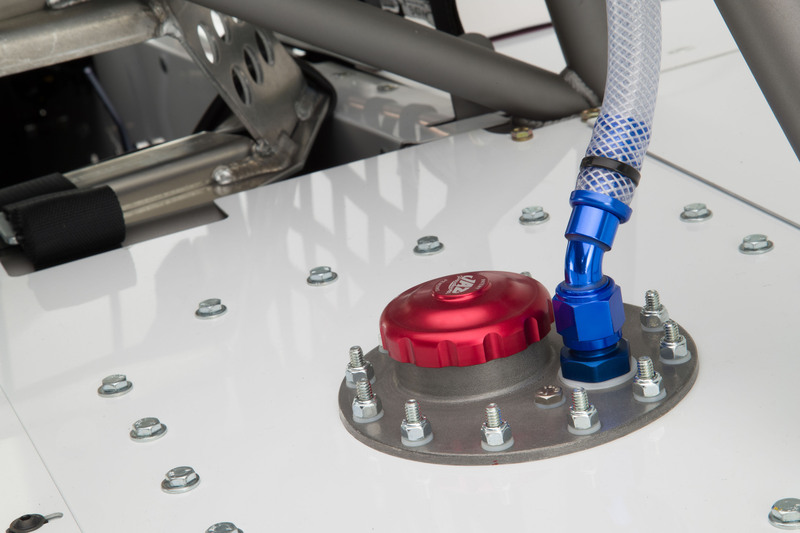 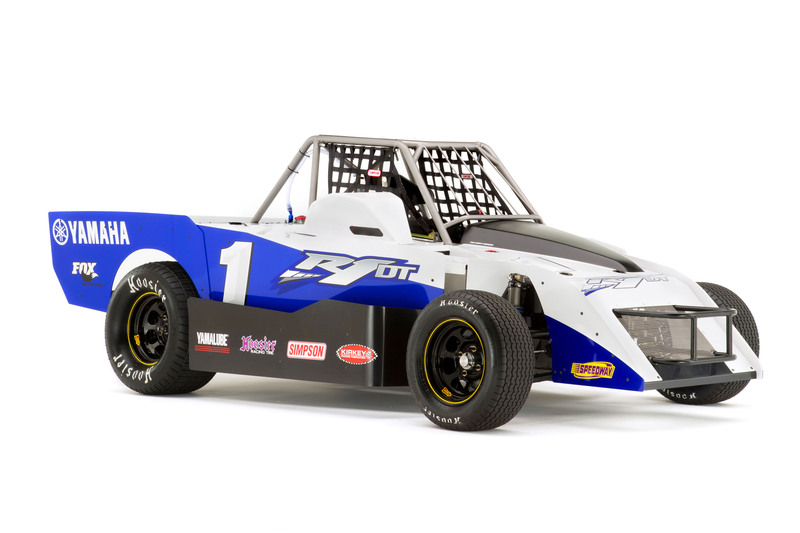 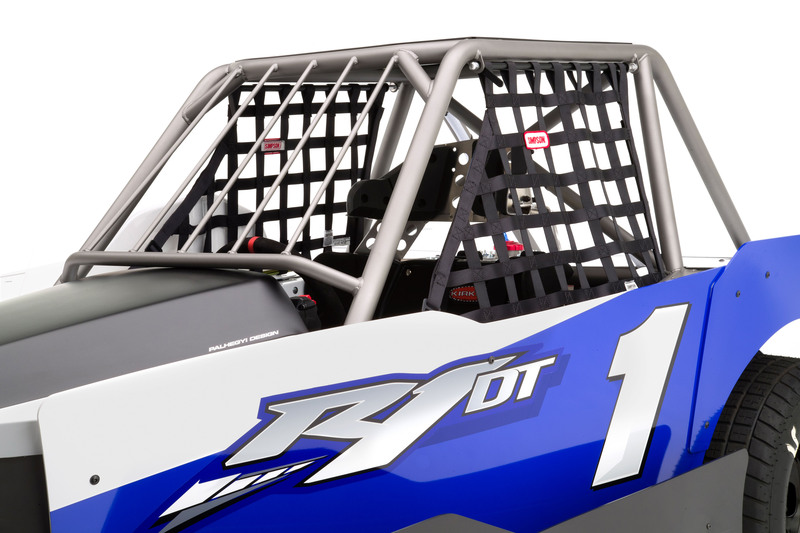 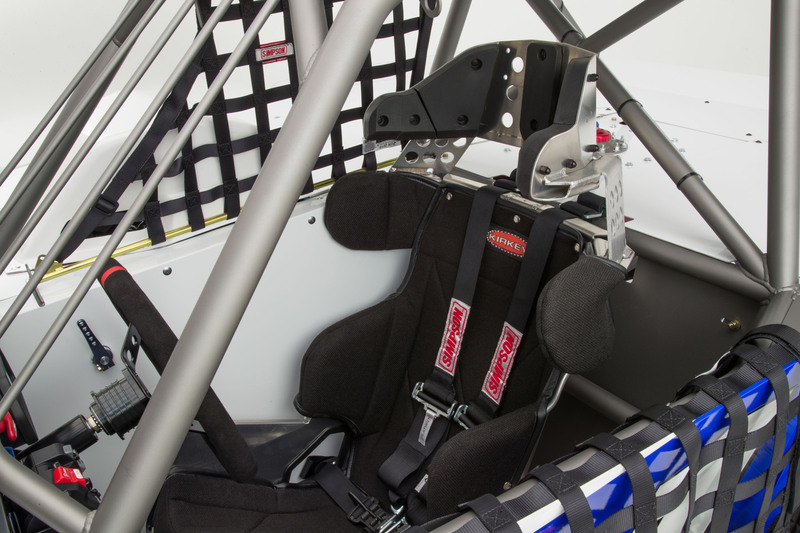 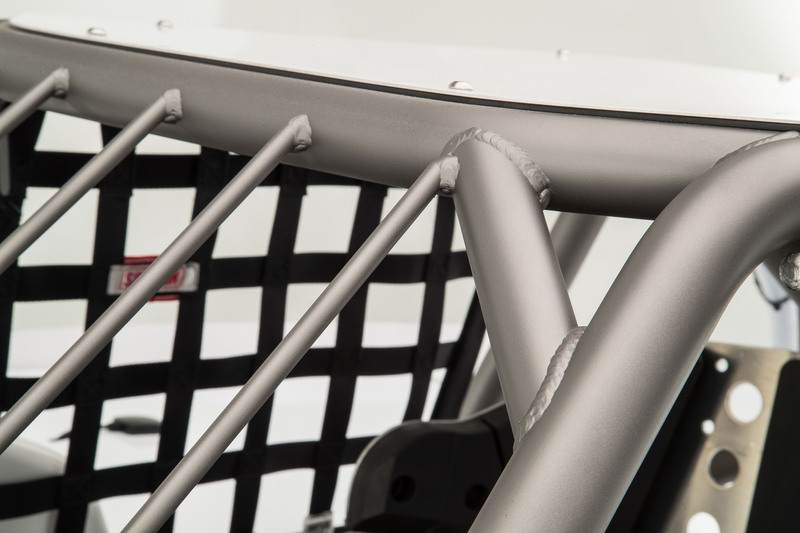 The R1DT is designed to be a budget-friendly, turnkey, low-maintenance option for aspiring racers. 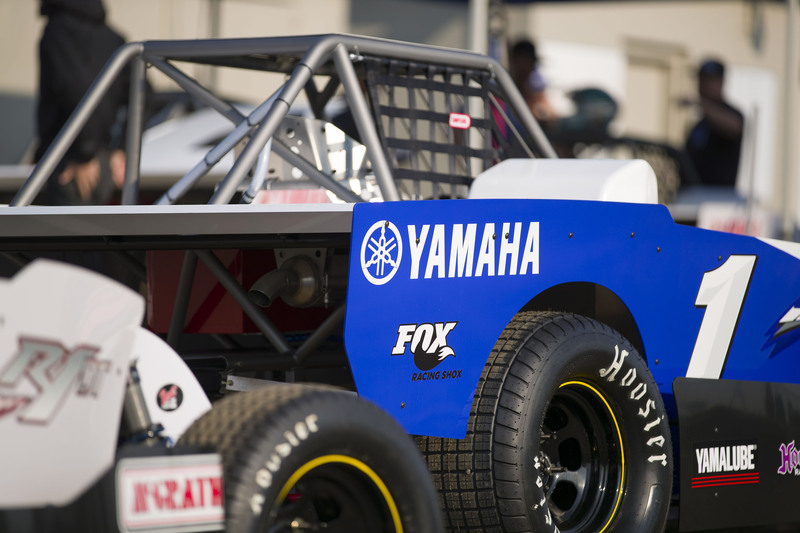 But why would Yamaha invest time and R&D resources to build a car? 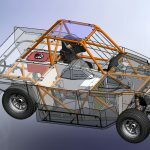 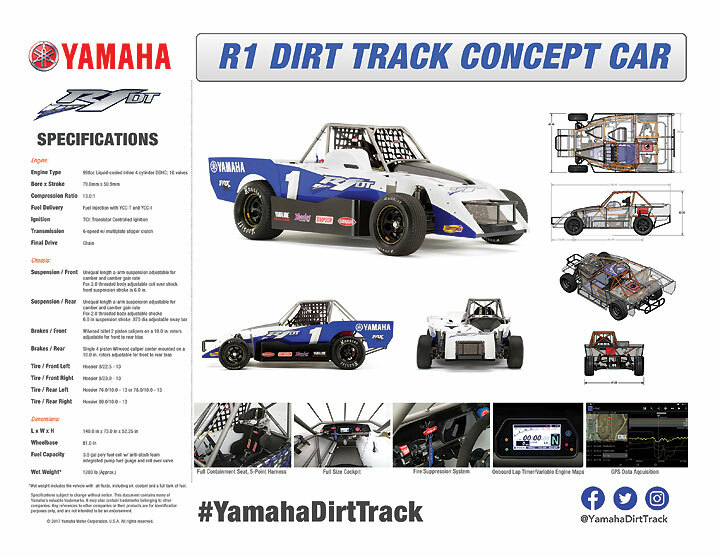 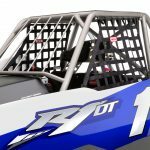 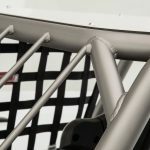 “The Yamaha R1DT concept car is an exciting new concept that has the potential to introduce dirt-track enthusiasts to Yamaha quality and performance while simultaneously attracting more motorsports enthusiasts and racers to the exciting world of dirt-track racing,” Yamaha’s R1DT project manager, Dave Park, elaborated. 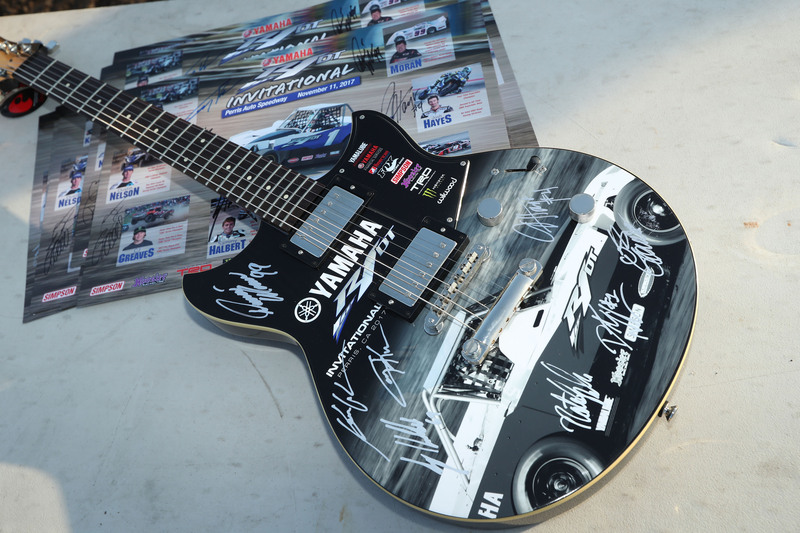 Yamaha enlisted longtime collaborator Jeff Palhegyi to create the cars. 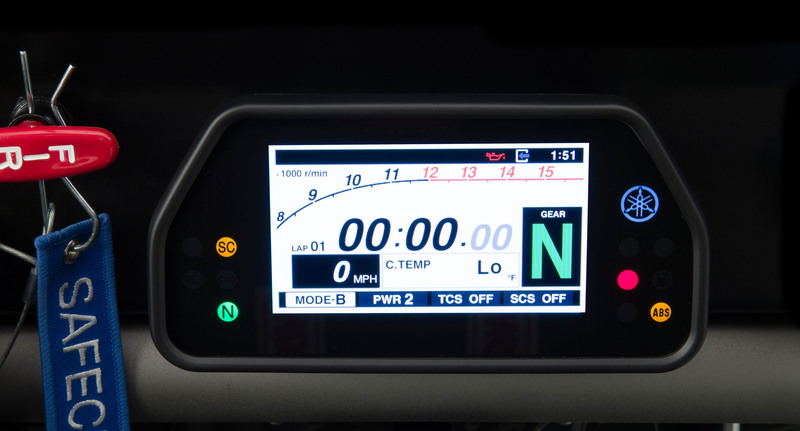 Palhegyi is the mastermind behind nearly every custom bike shown by Yamaha Motor Corp. USA over more than a decade, as well as playing an integral role in developing Yamaha’s DT-07 flat-track bike. 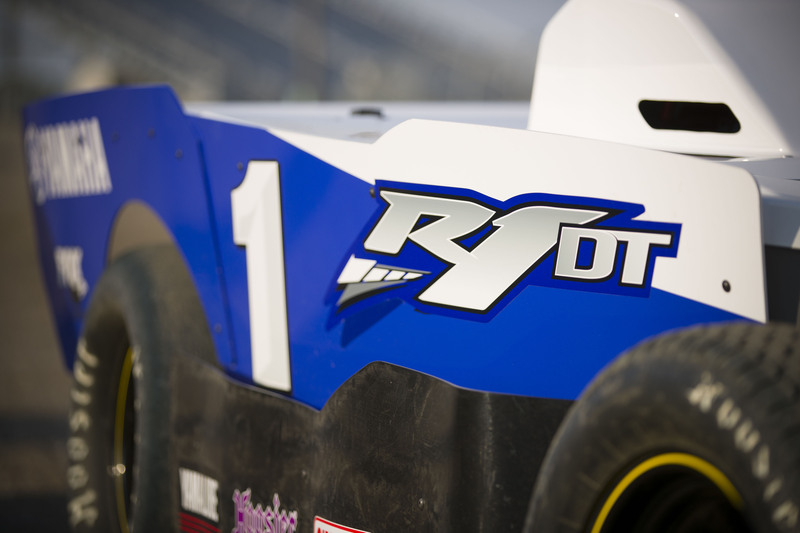 The R1DT is his latest challenge. 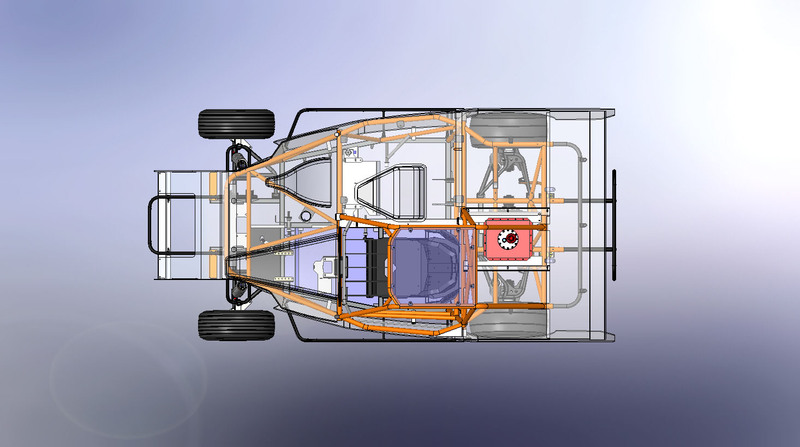 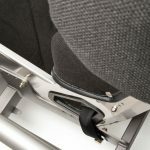 Fitted with the 998cc inline four-cylinder engine from Yamaha’s YZF-R1S production superbike mounted behind the driver, the car has undergone two revisions since the first version put wheels on the ground a couple of years ago. 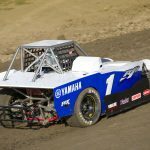 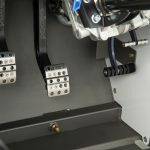 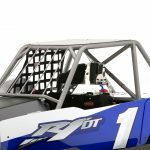 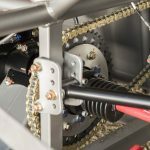 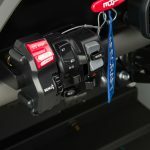 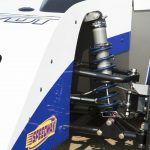 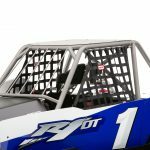 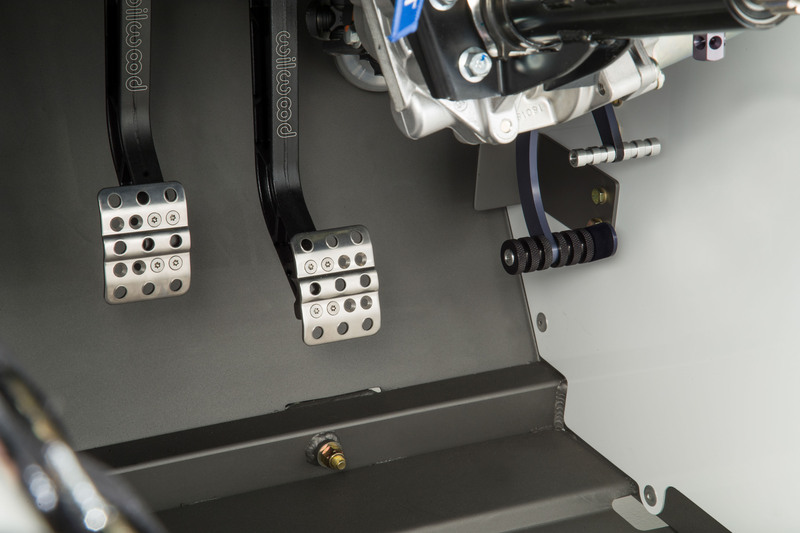 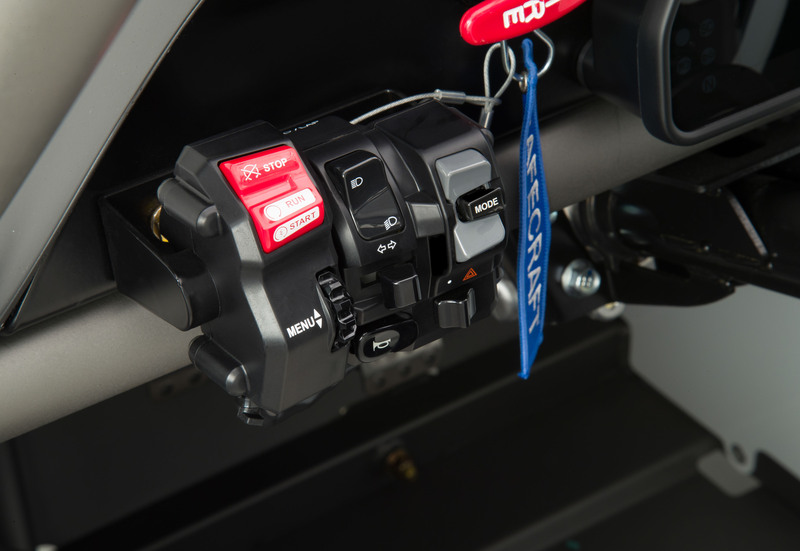 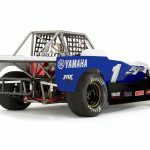 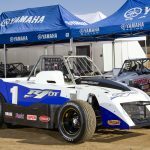 Yamaha says the R1 motor can handle the rigors of dirt-track racing without requiring modifications and can assist in advancing a novice driver’s skill level and experience via adjustable engine outputs and data acquisition. 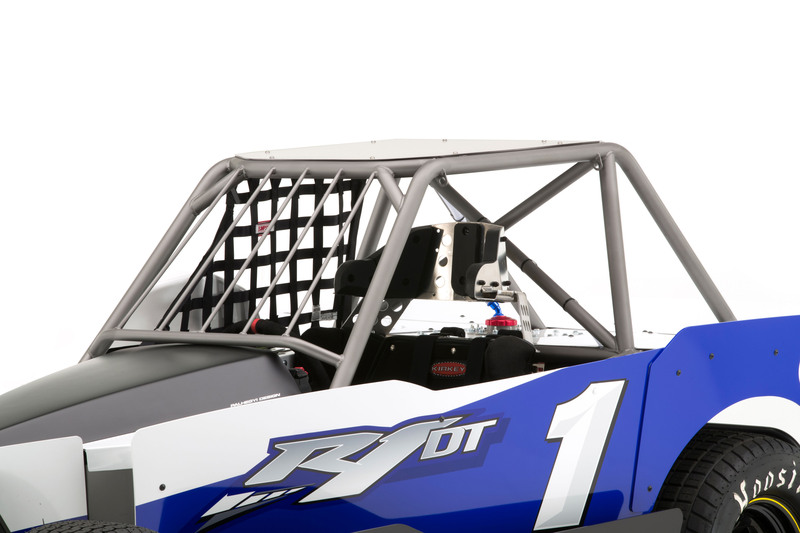 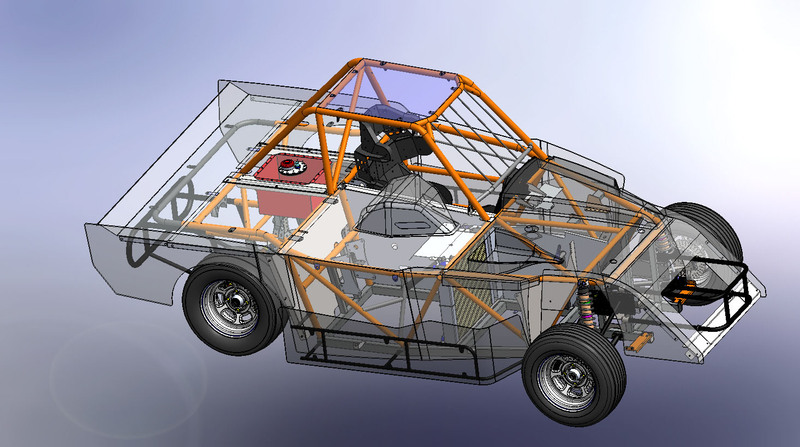 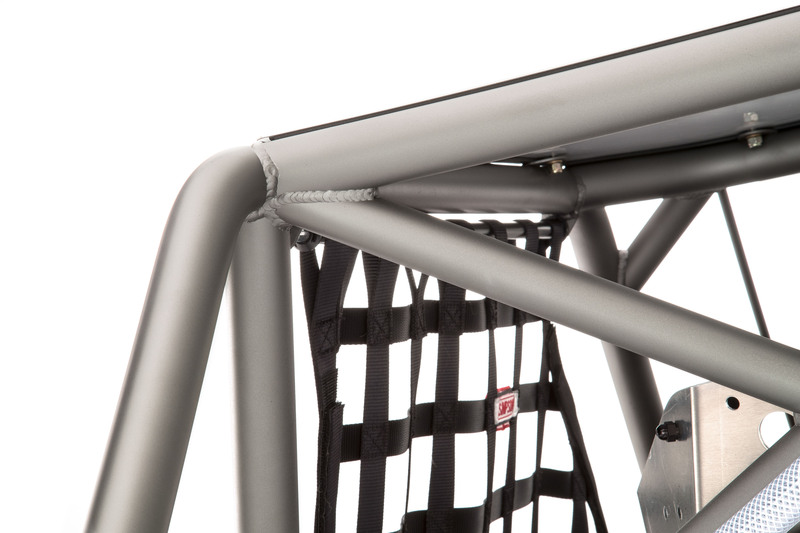 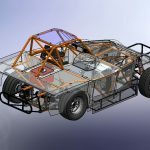 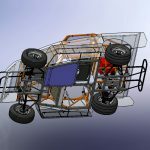 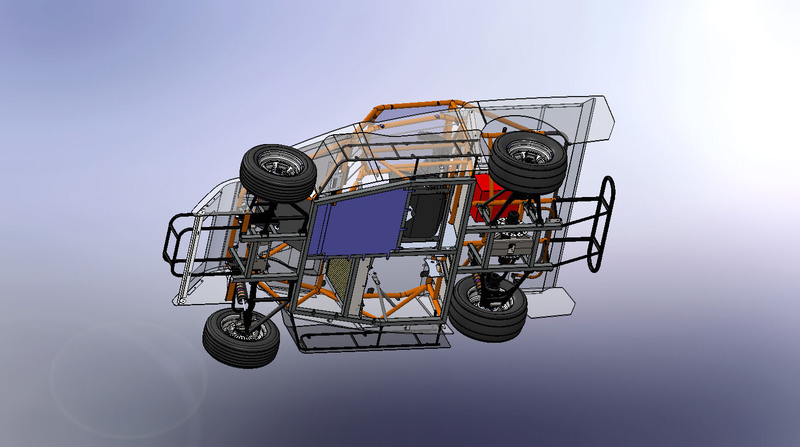 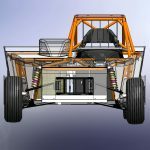 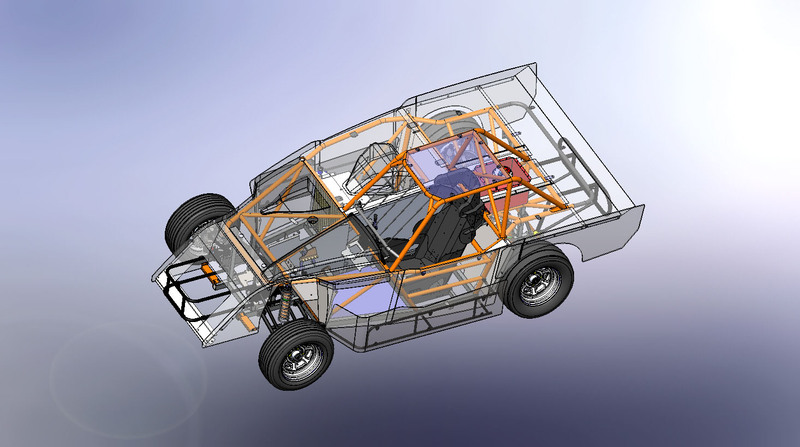 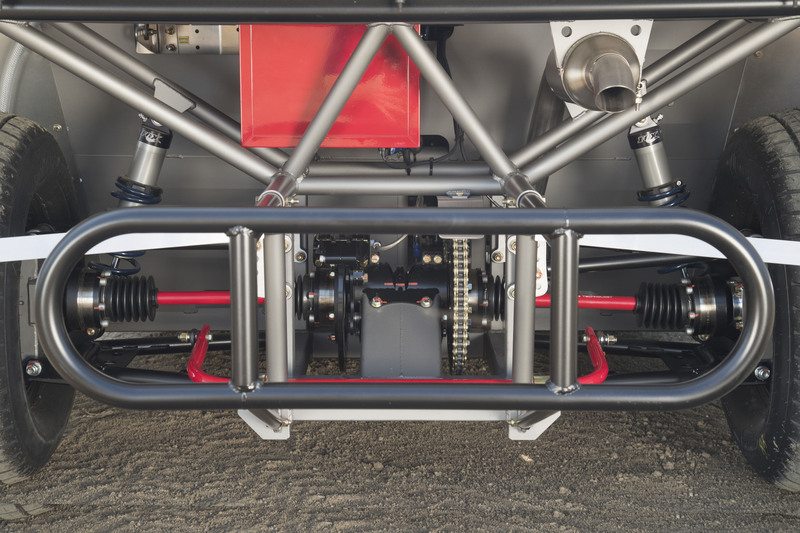 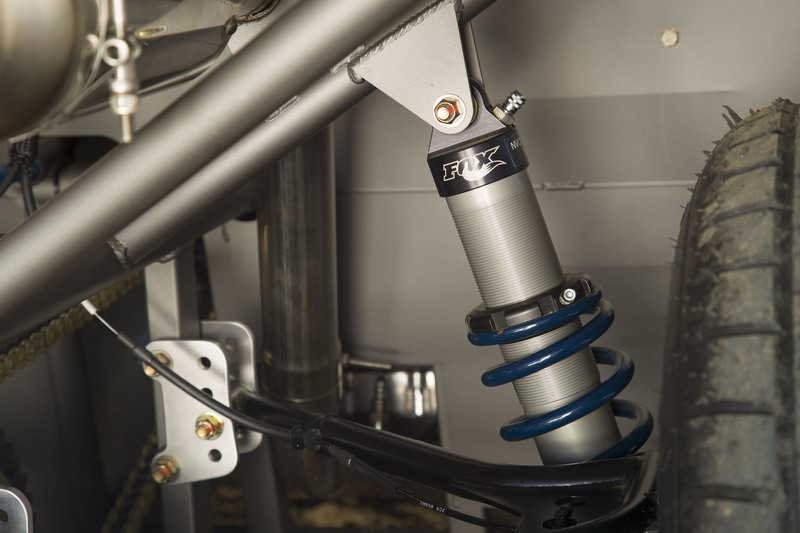 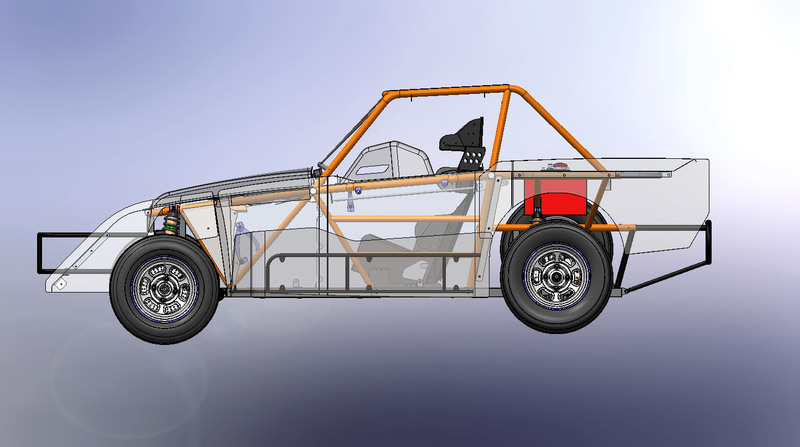 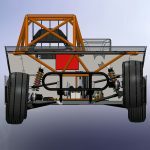 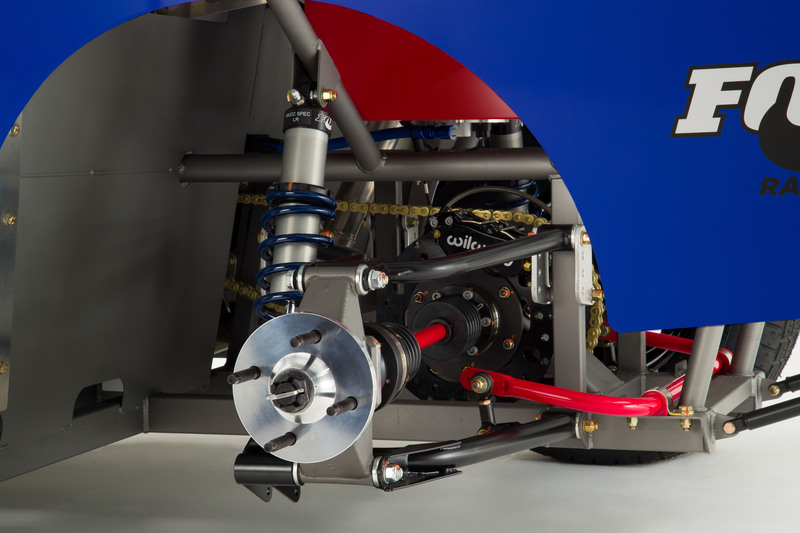 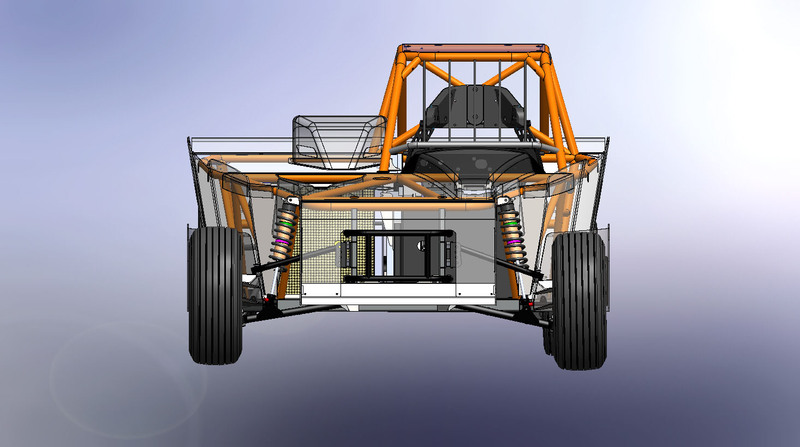 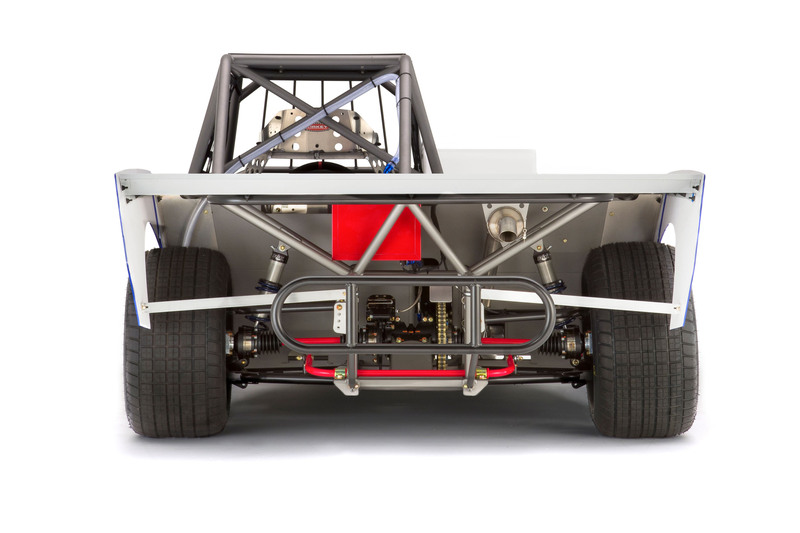 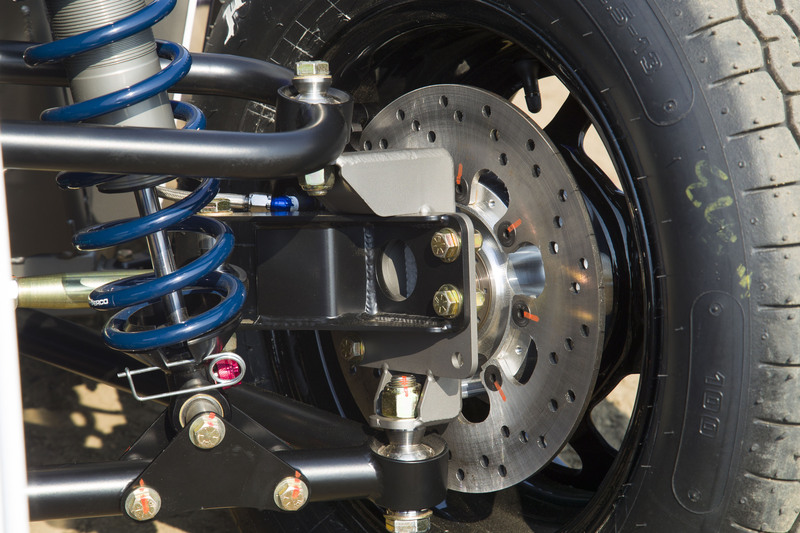 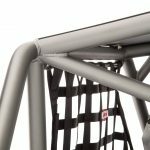 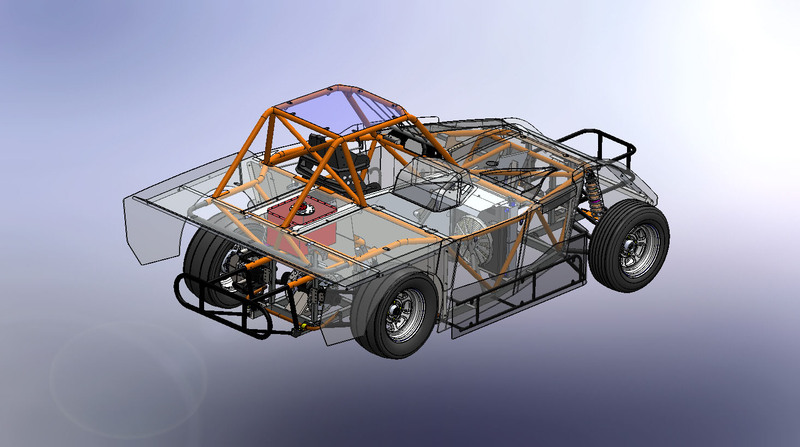 The R1DT uses an A-arm suspension within an 81-inch wheelbase and is purported to weigh about 1200 pounds. 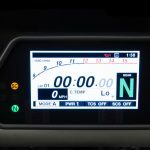 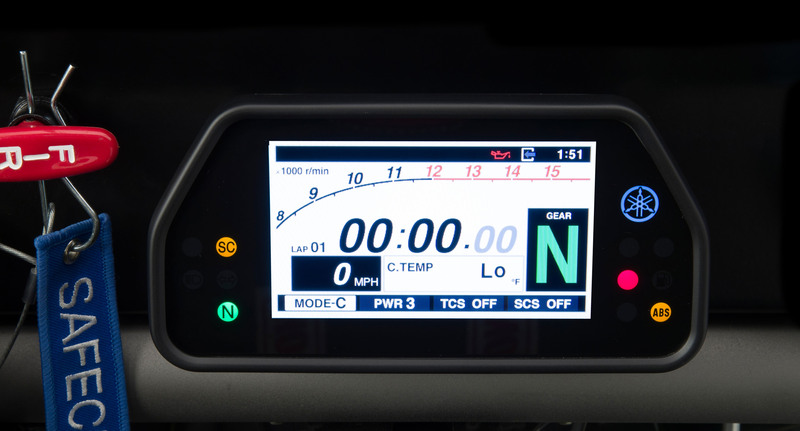 The instrument panel is borrowed from the R1. 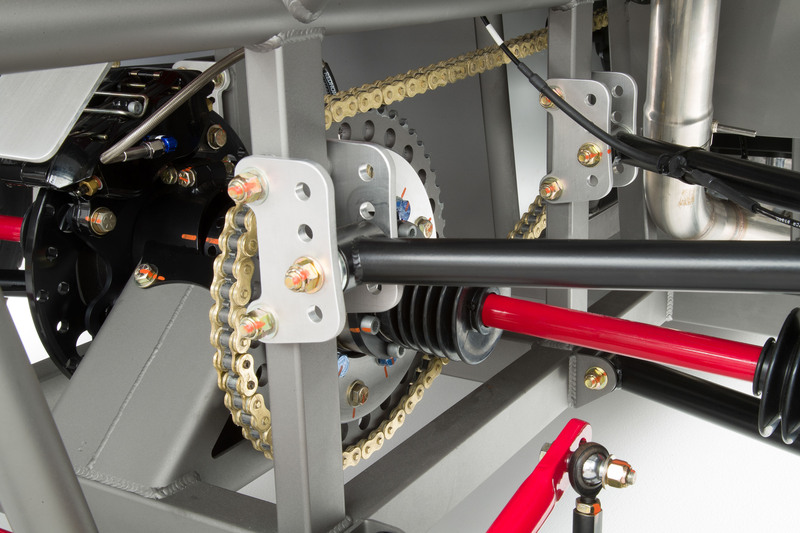 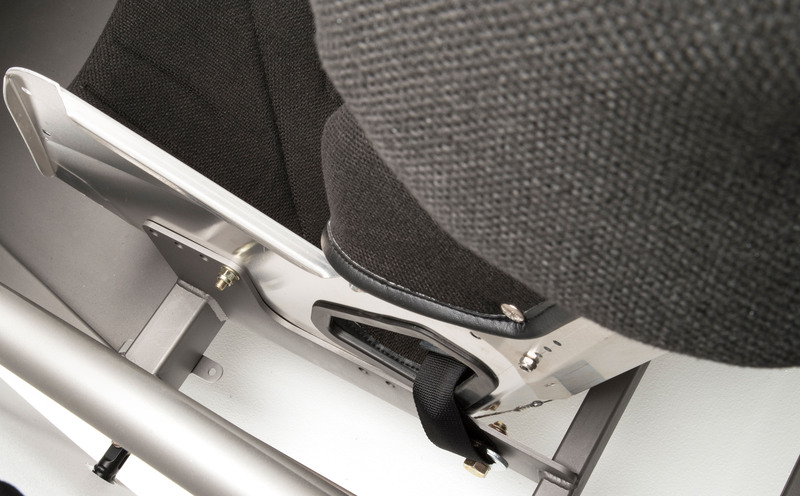 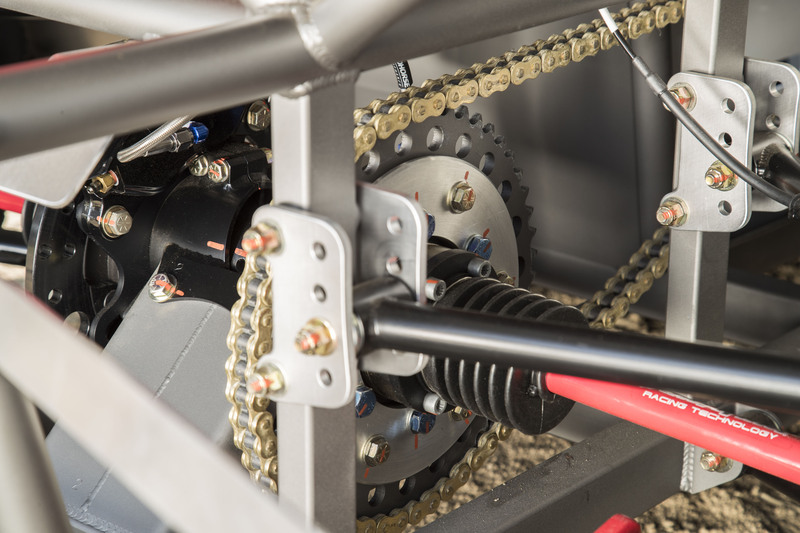 The engine sends its power to the rear wheels via a chain drive. 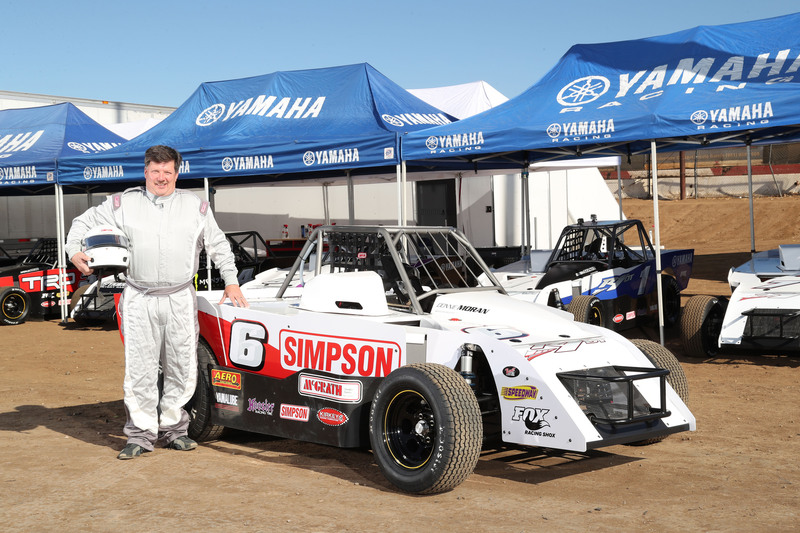 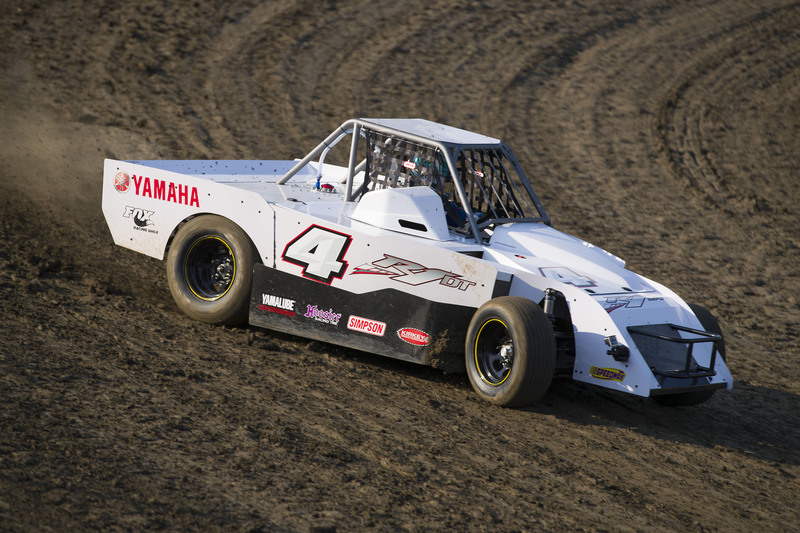 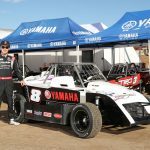 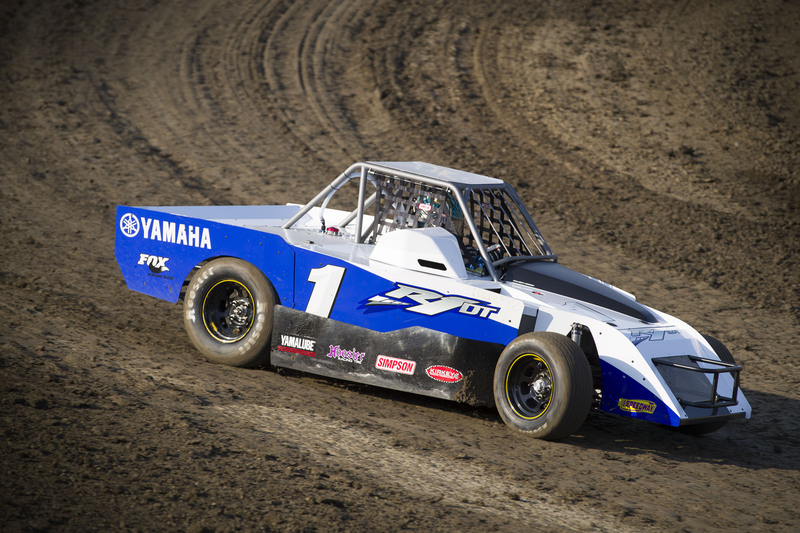 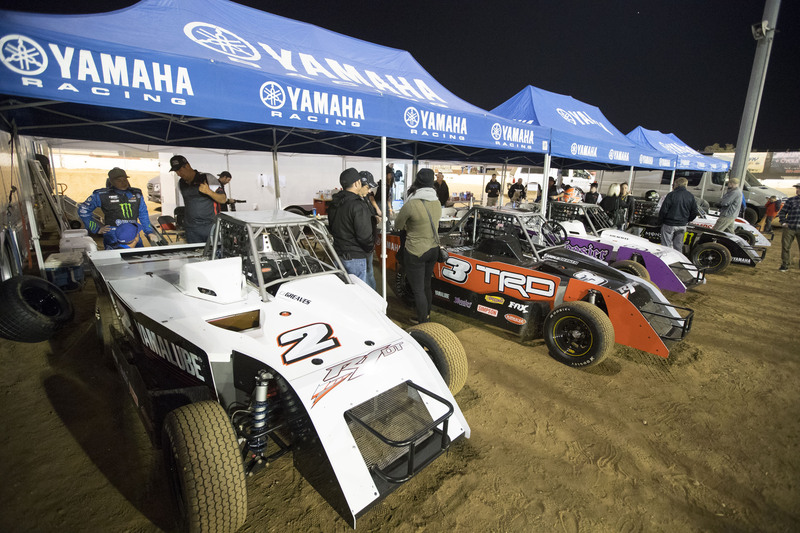 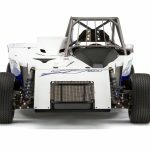 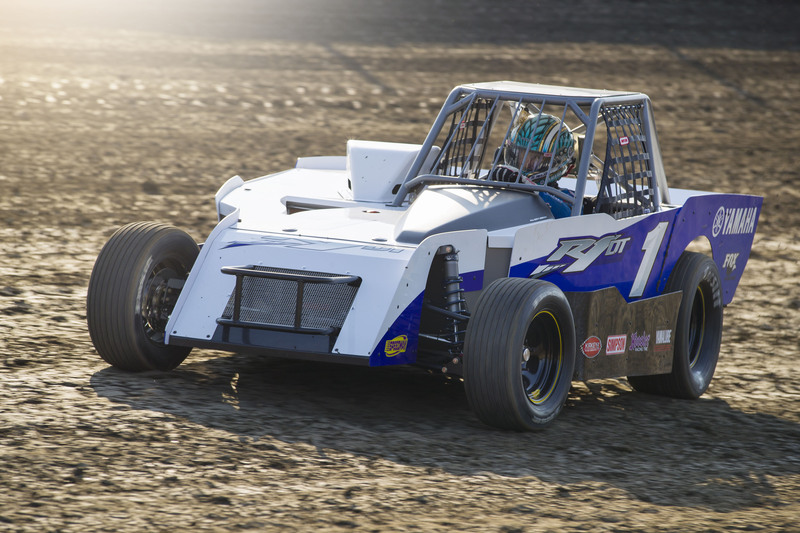 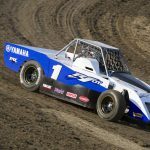 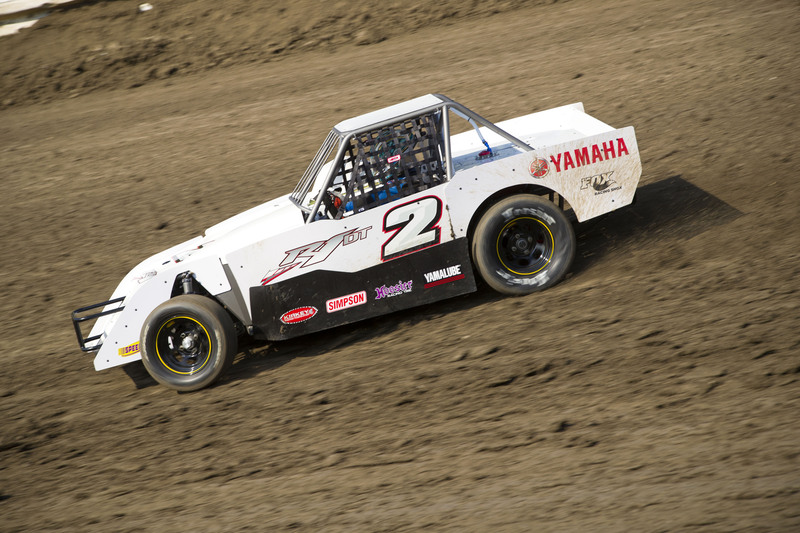 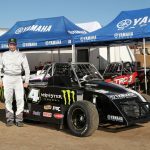 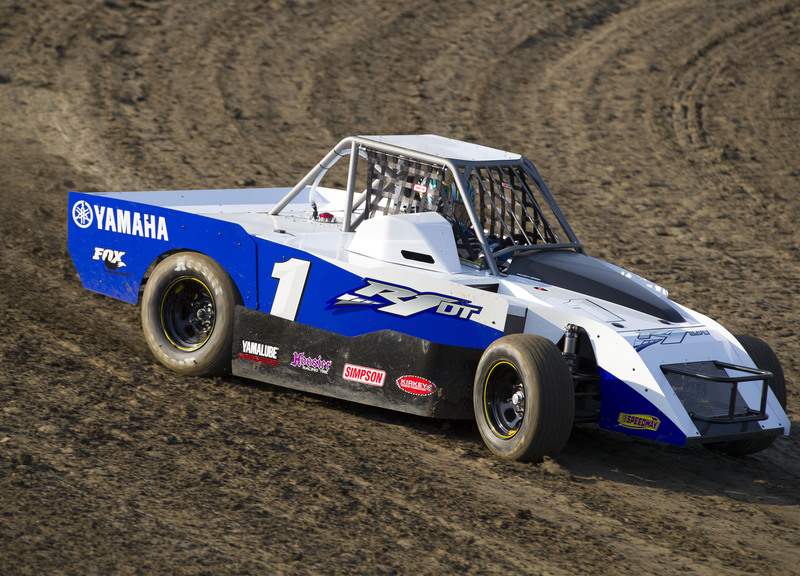 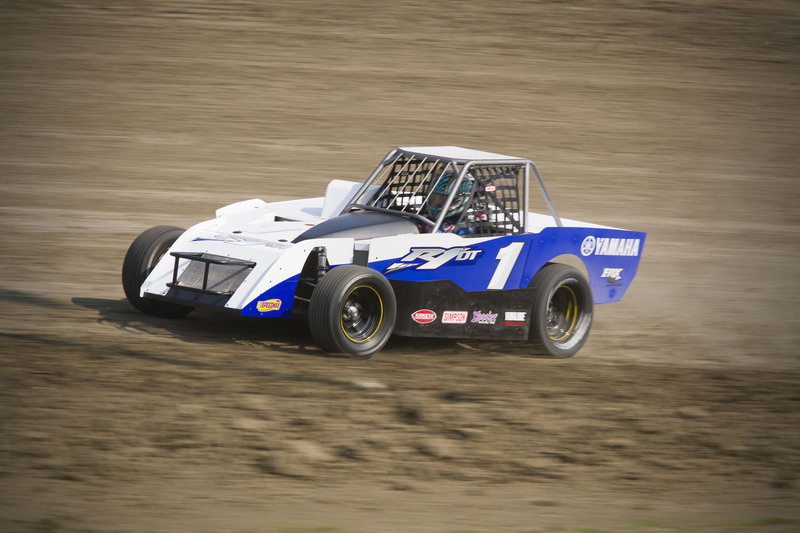 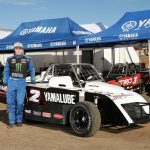 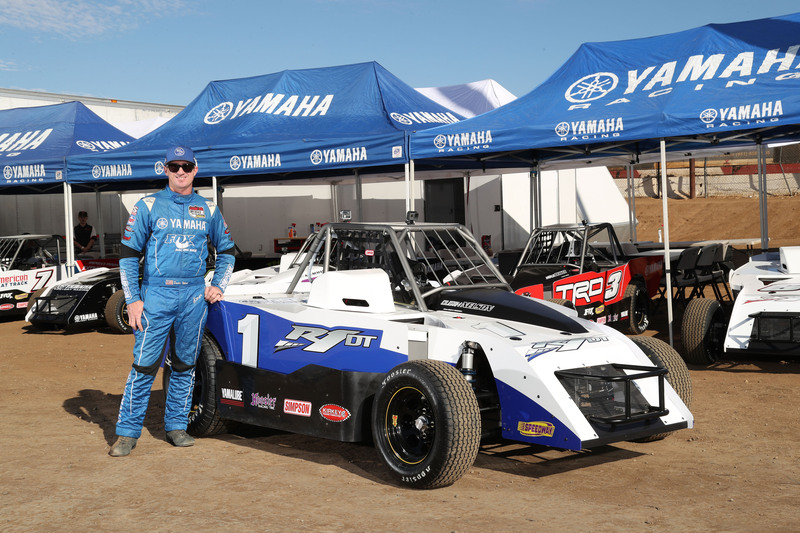 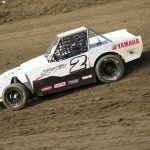 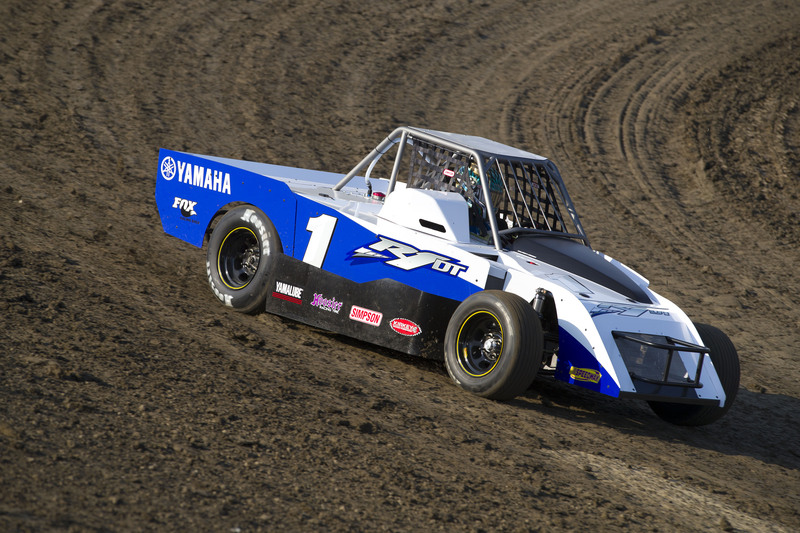 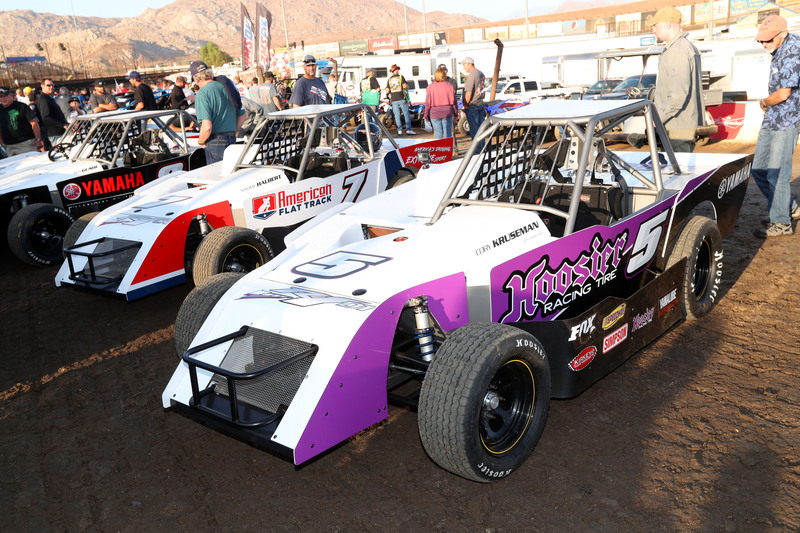 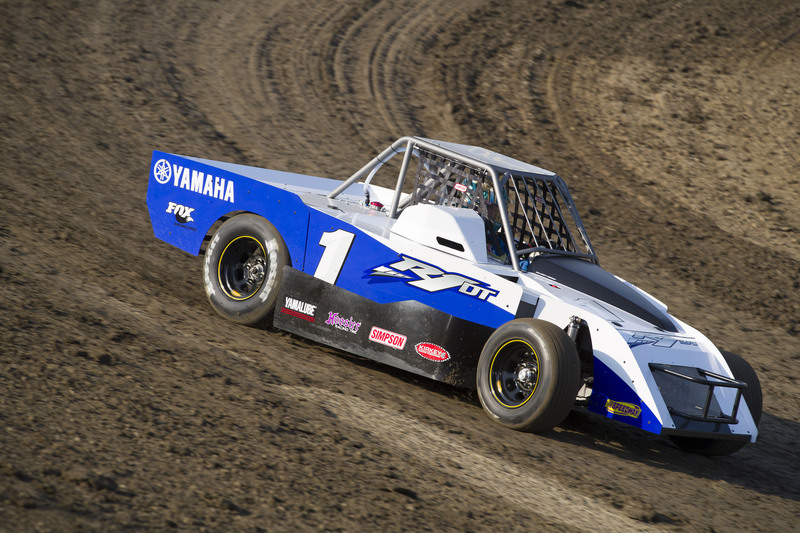 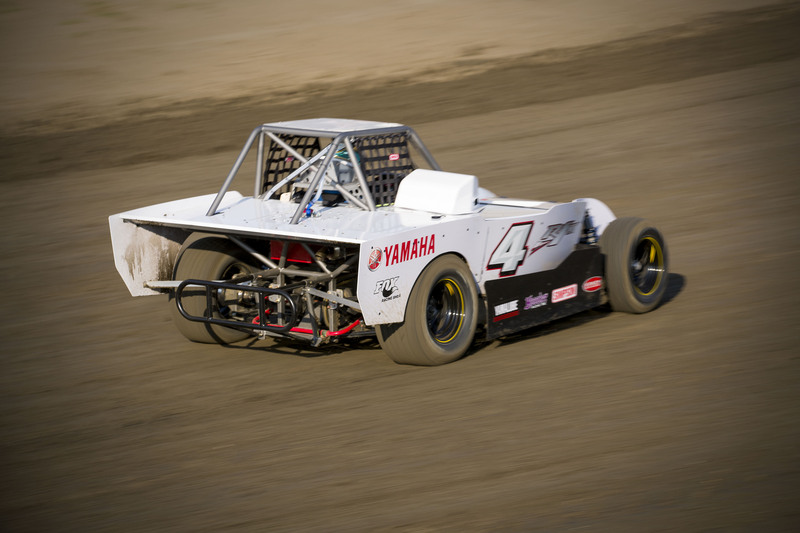 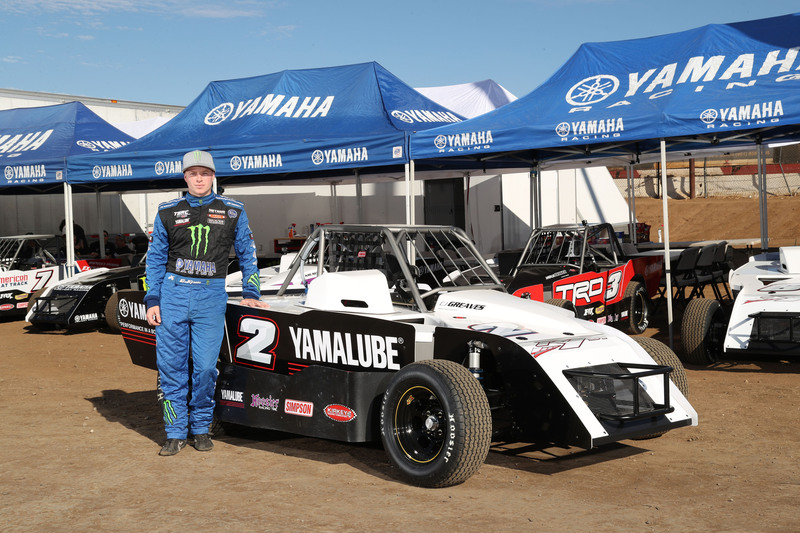 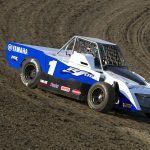 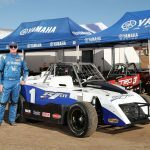 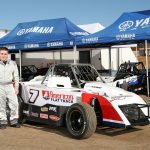 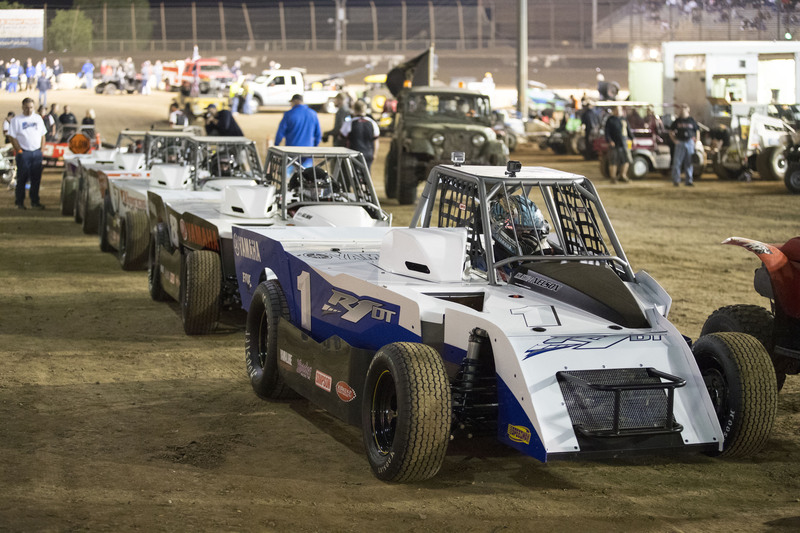 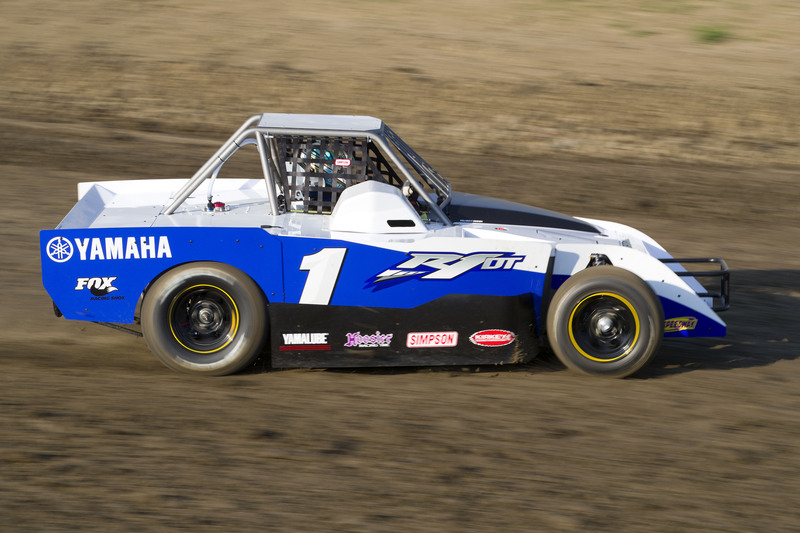 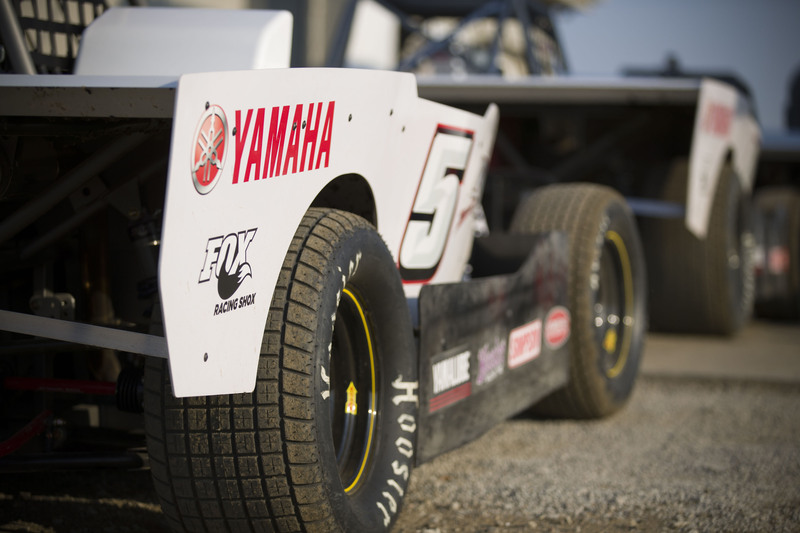 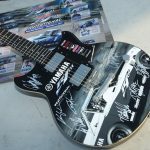 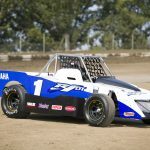 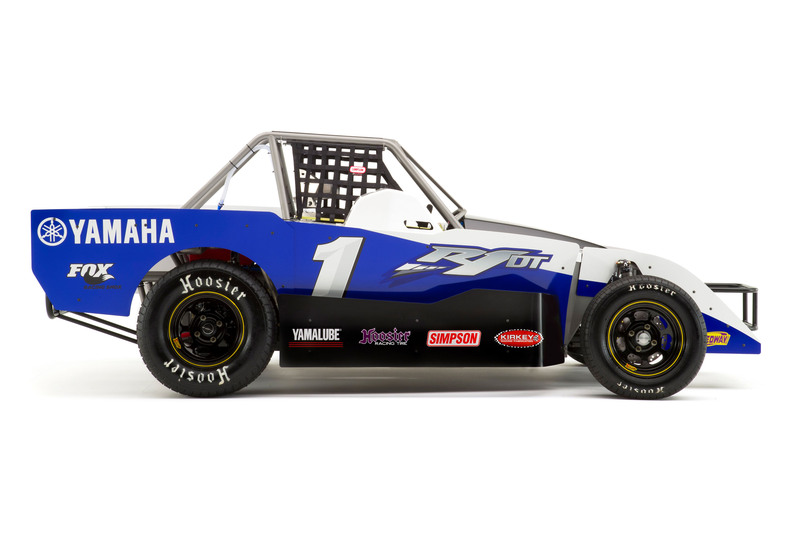 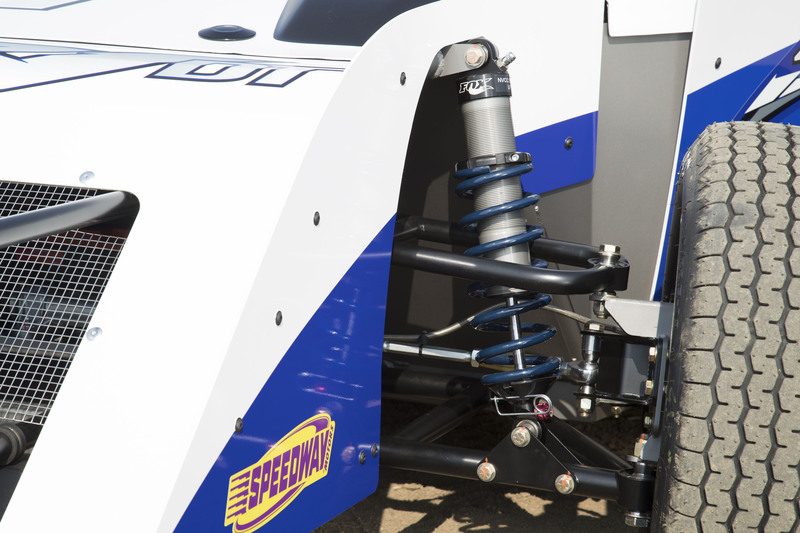 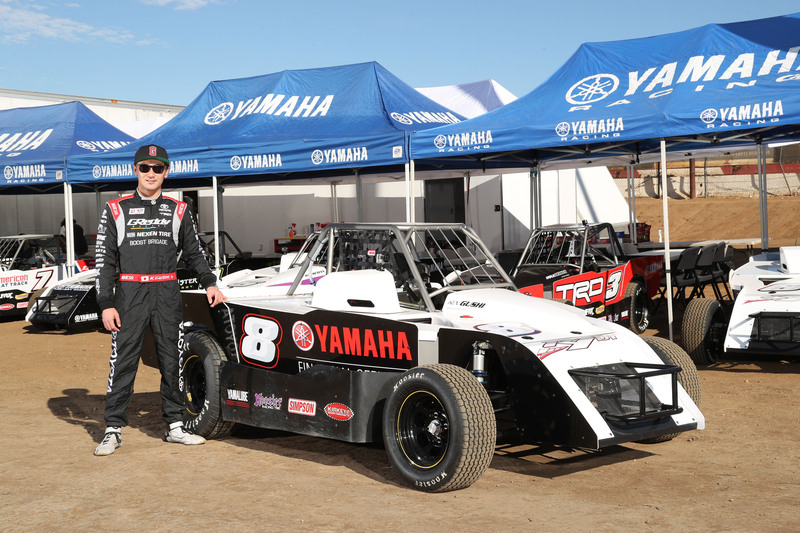 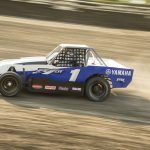 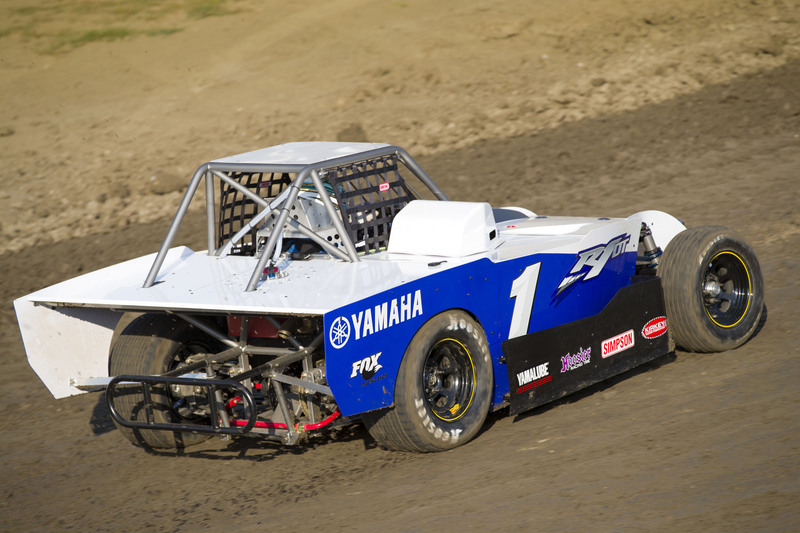 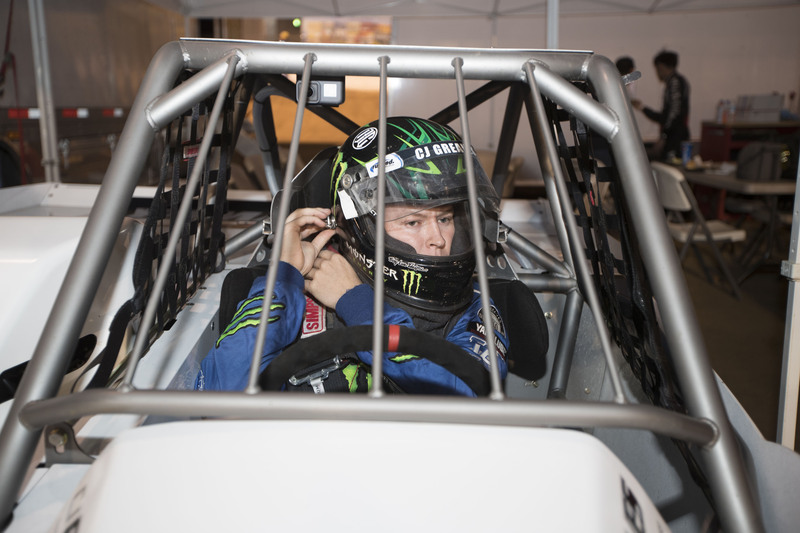 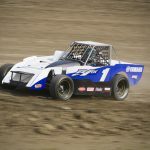 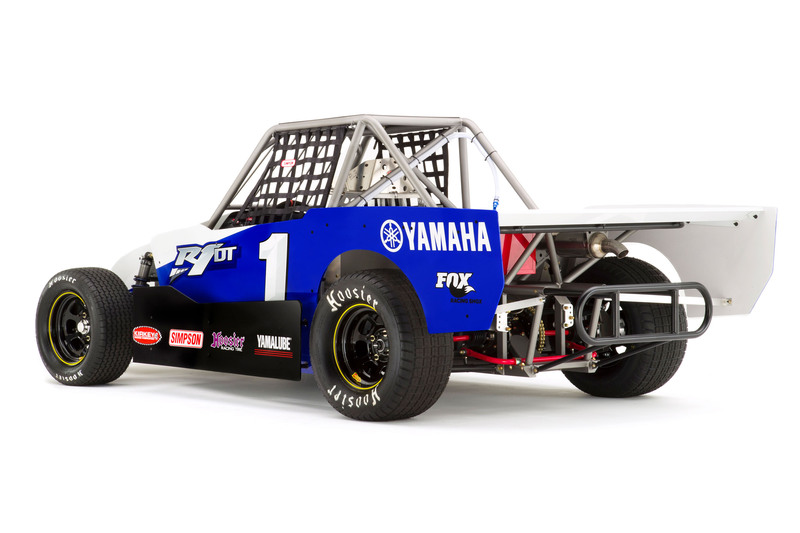 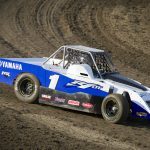 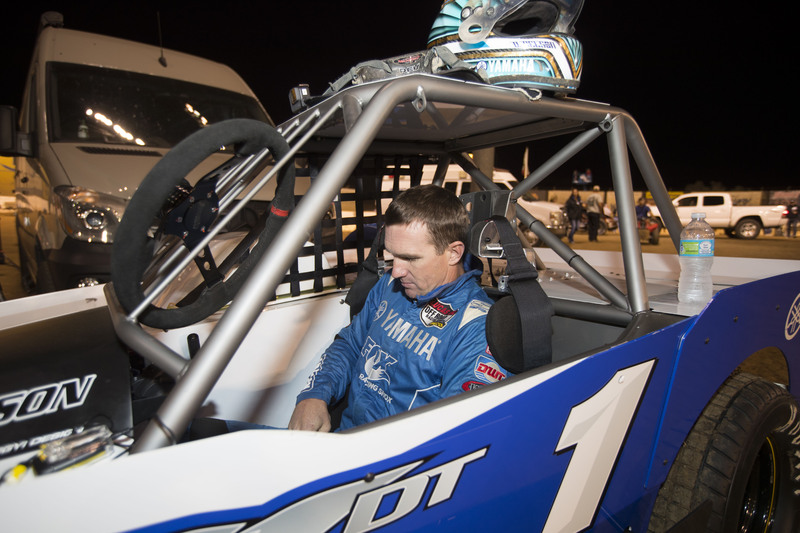 To put the cars to the test at Perris Auto Speedway, Yamaha invited drivers from a variety of racing disciplines. 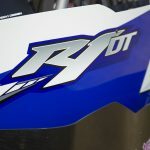 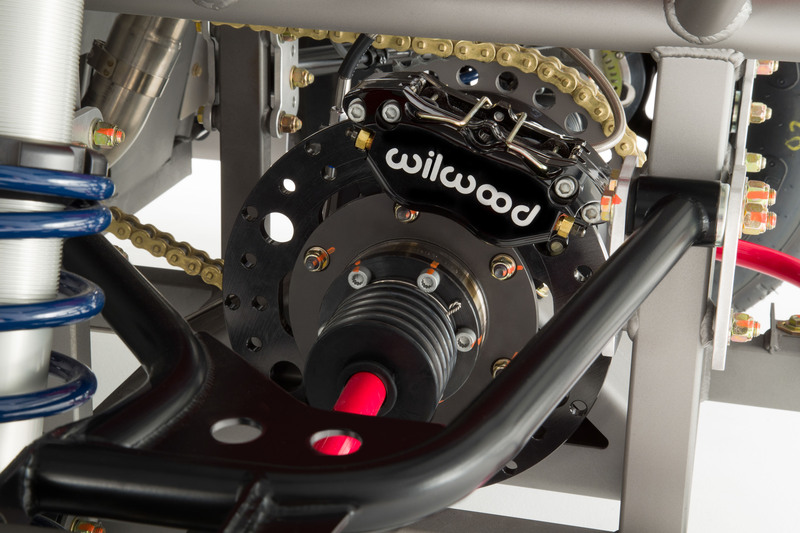 The moto world was represented by four-time AMA Superbike champion Josh Hayes, AMA Flat Track Grand National champ “Slammin’” Sammy Halbert, and former AMA Four-Stroke National Motocross champion Dustin Nelson. 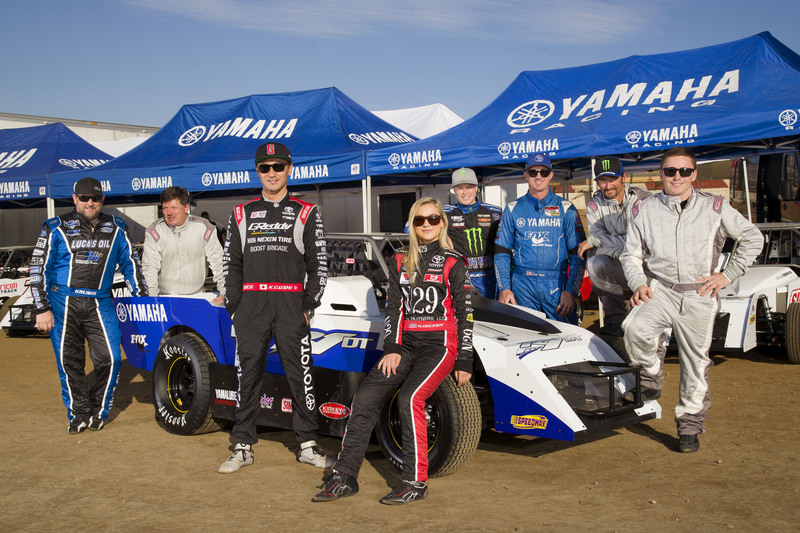 Drivers from four-wheeled disciplines included Formula DRIFT and D1 veteran Ken Gushi, sprint car and Midget racing legend Cory Kruseman, Late Model stock-car racing vet Donnie Moran, 2012 ARCA Super Stock class champion Natalie Decker, and CJ Greaves, a three-time Pro 4 champion, three-time Pro 2 champion and current Pro Stock UTV champion of the Traxxas Off-Road Championship Series. 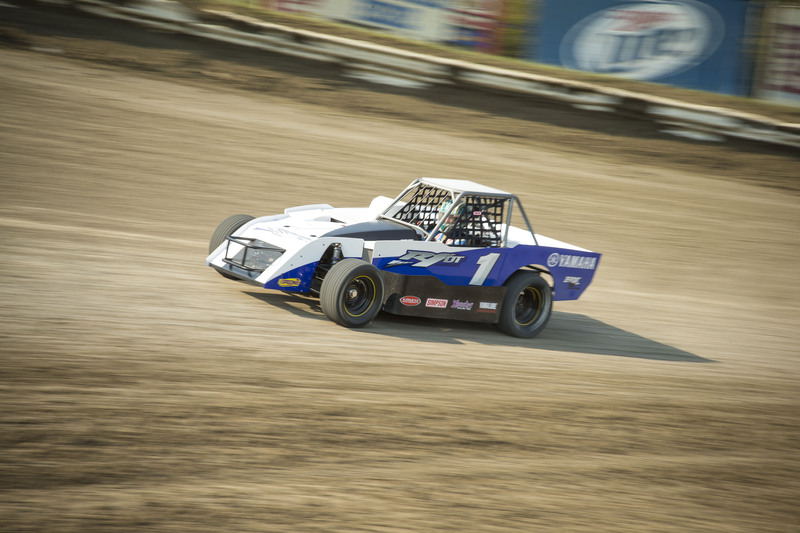 Watching the R1DT cars rip around the 3/8-mile speedway oval was fascinating. 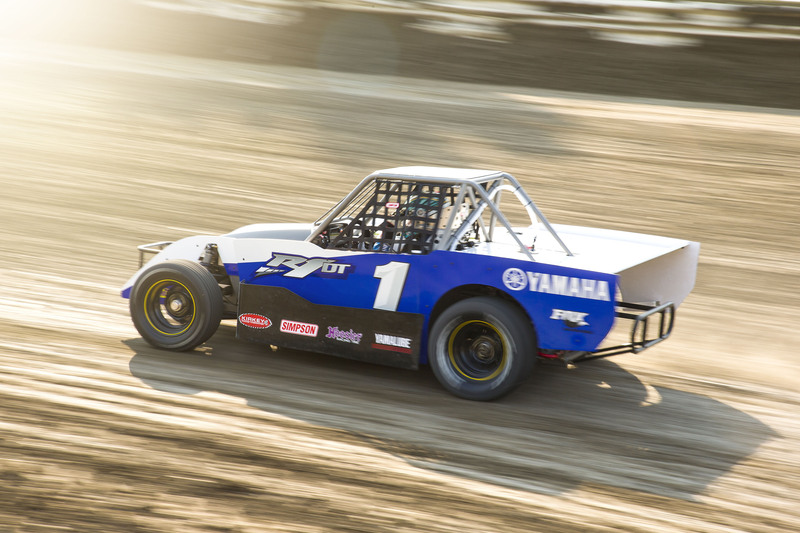 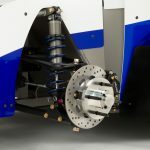 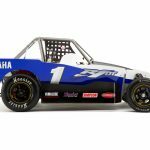 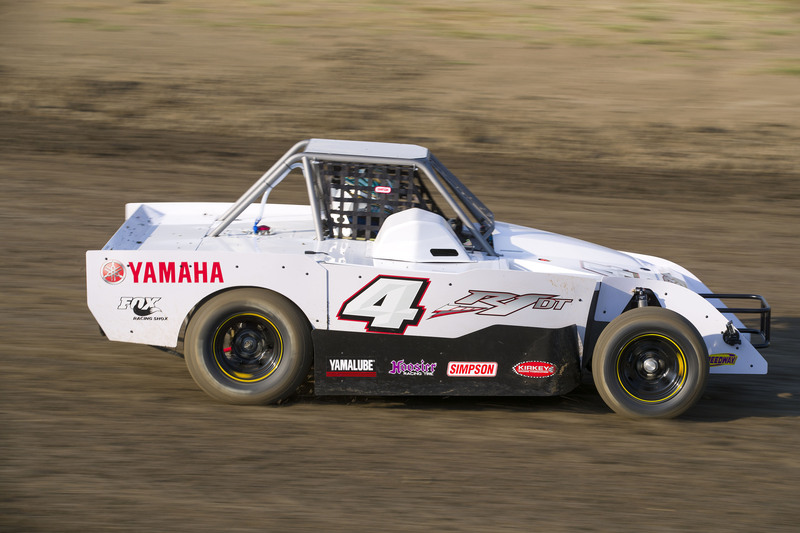 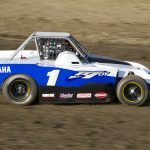 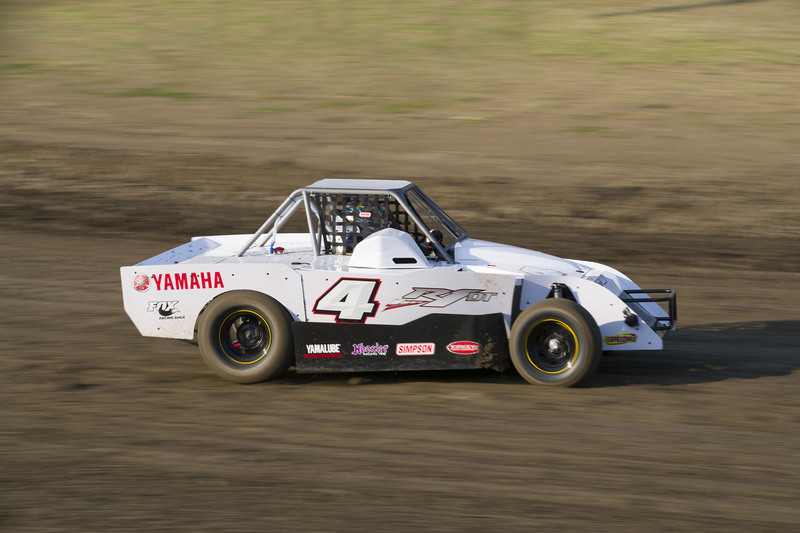 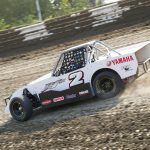 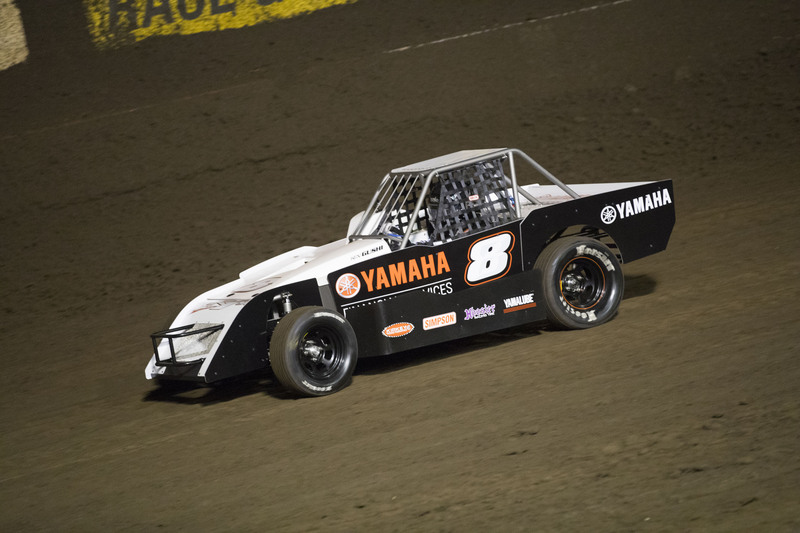 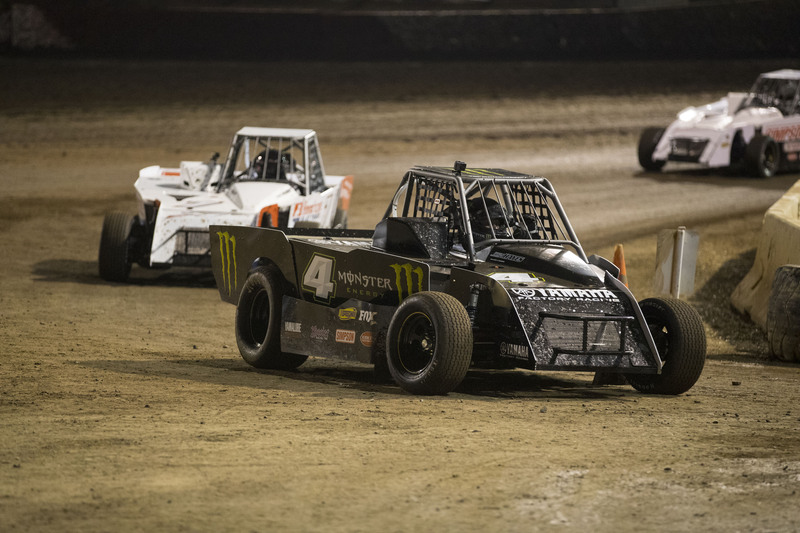 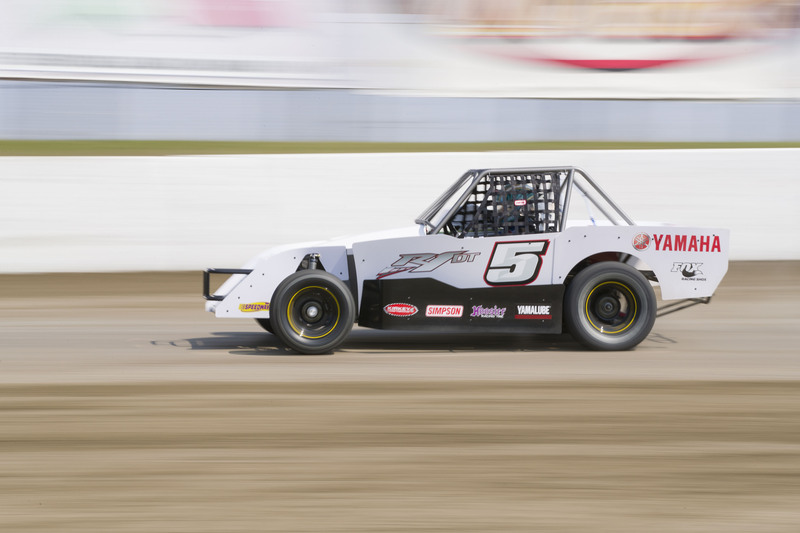 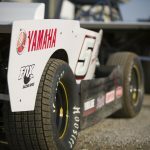 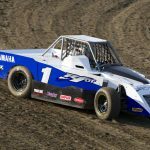 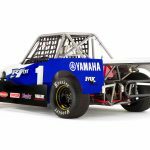 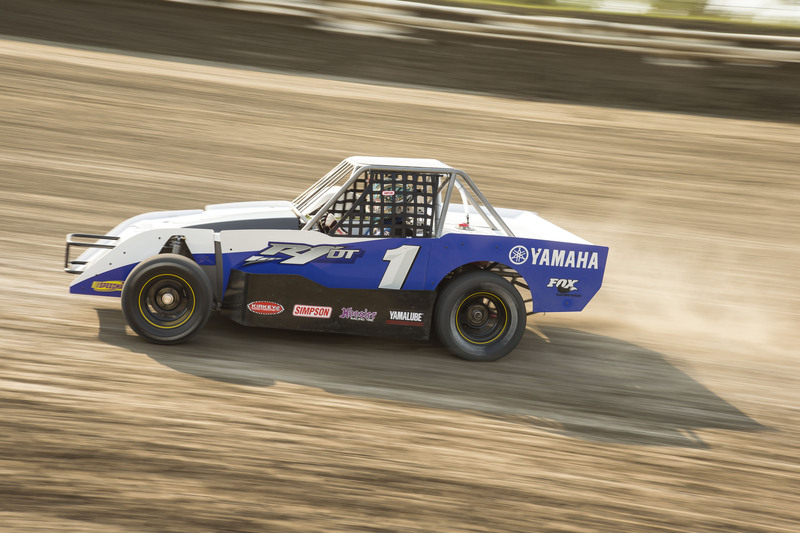 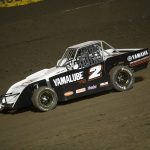 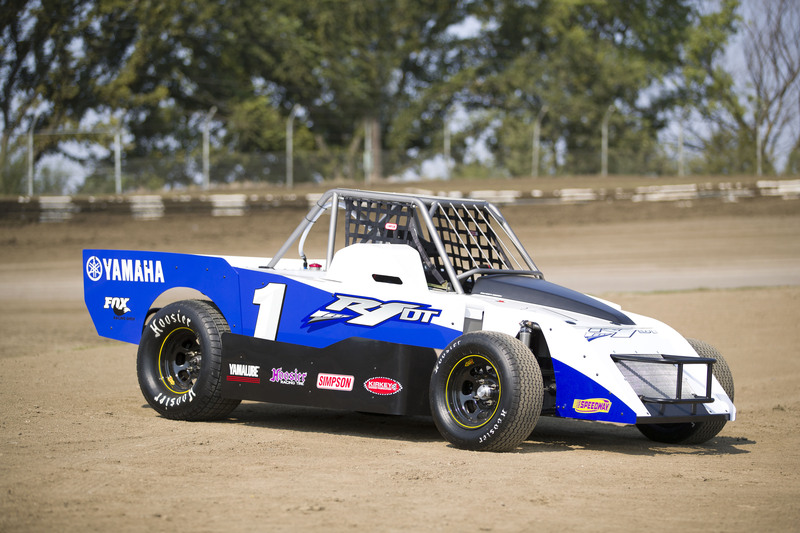 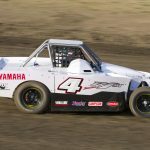 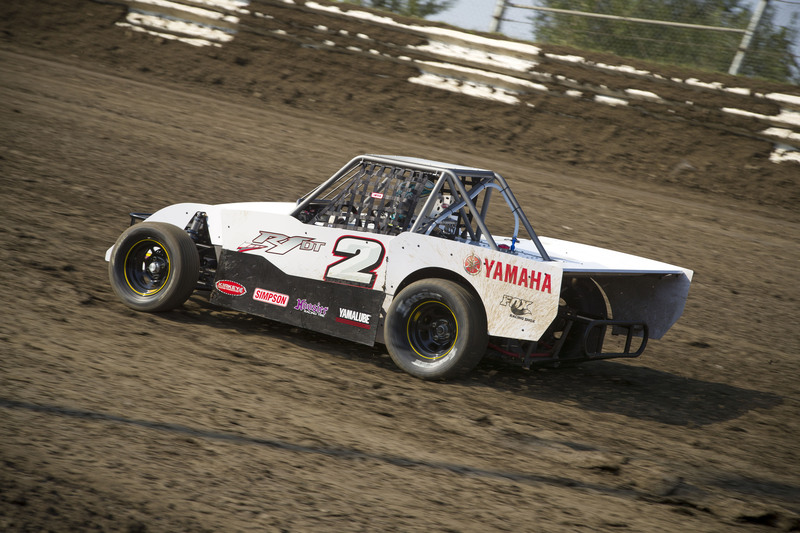 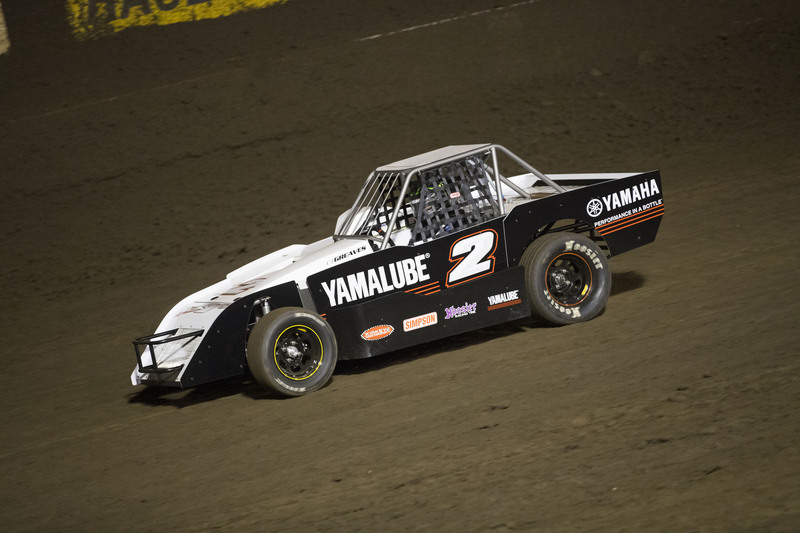 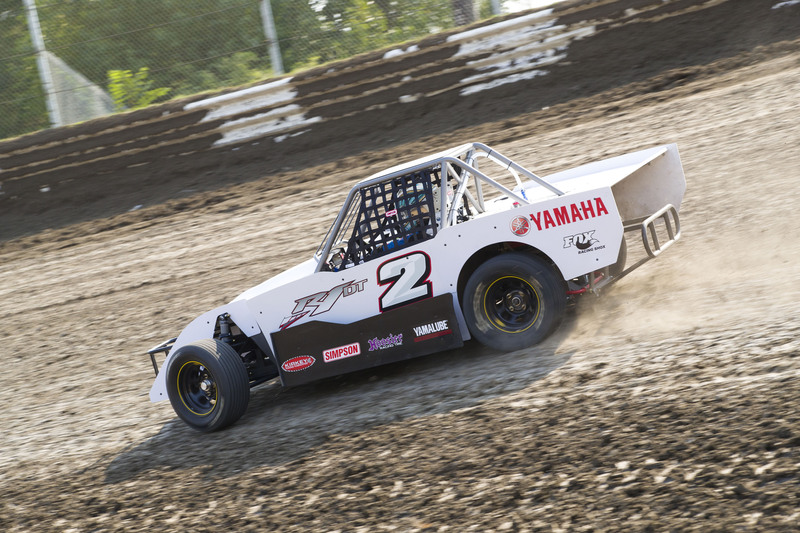 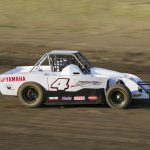 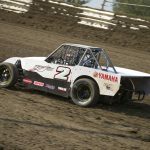 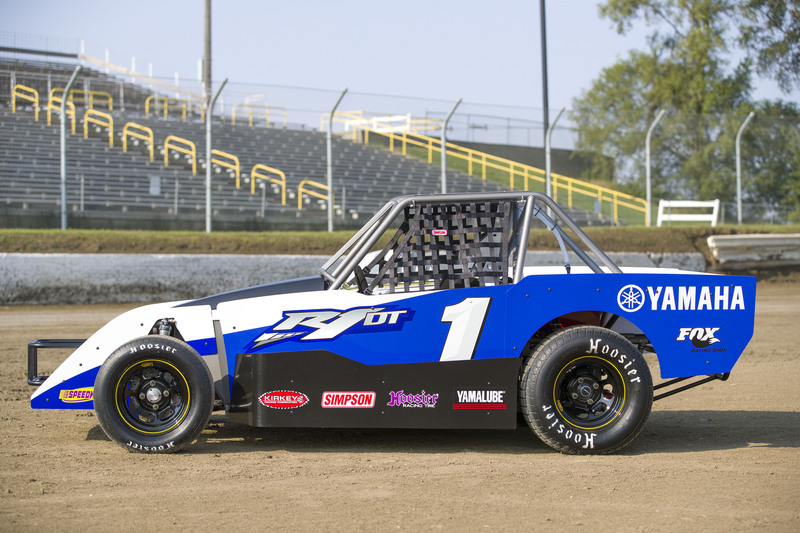 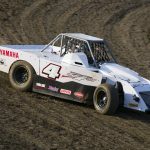 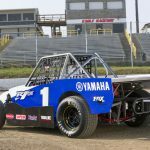 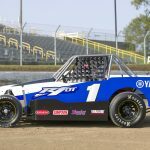 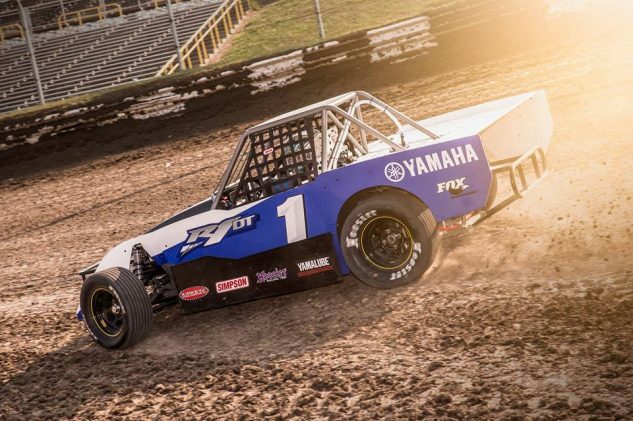 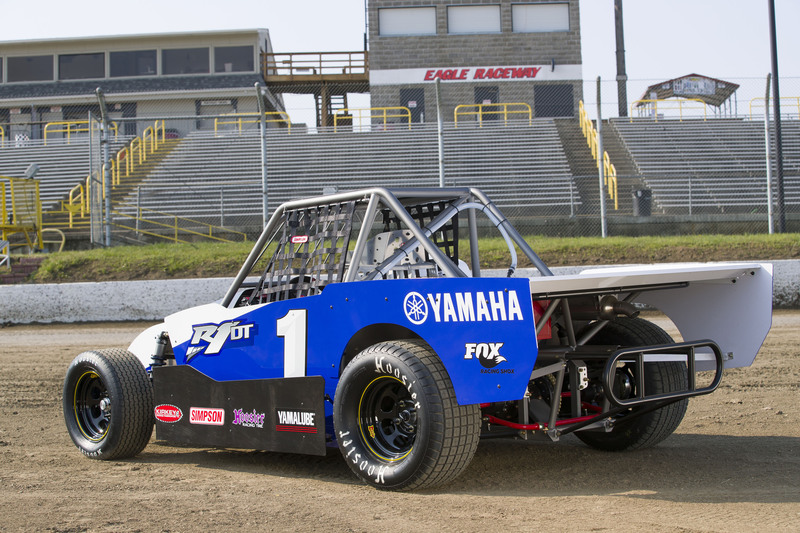 While the Yamaha drivers were pitching their cars sideways on the semi-banked clay track like typical dirt-track cars, their laps included gear shifts that aren’t in play with single-speed sprint cars. 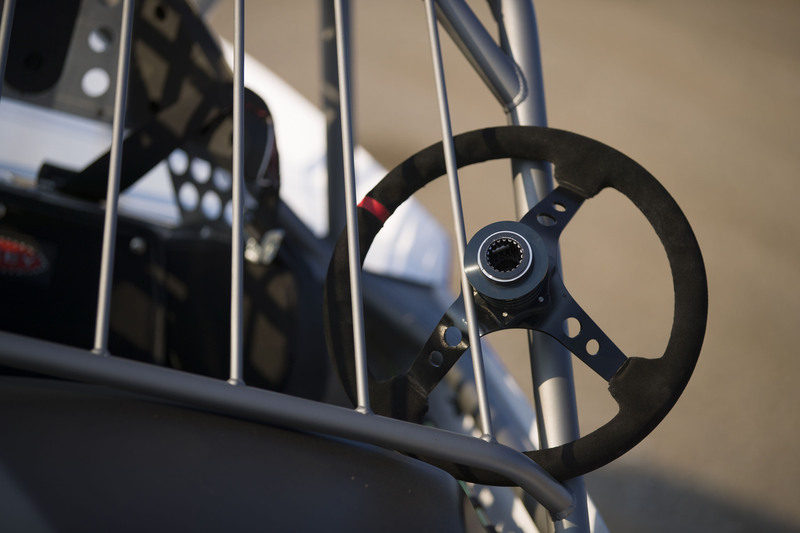 And just when and if to change gears added to the challenge. 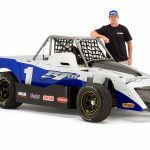 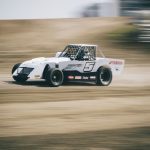 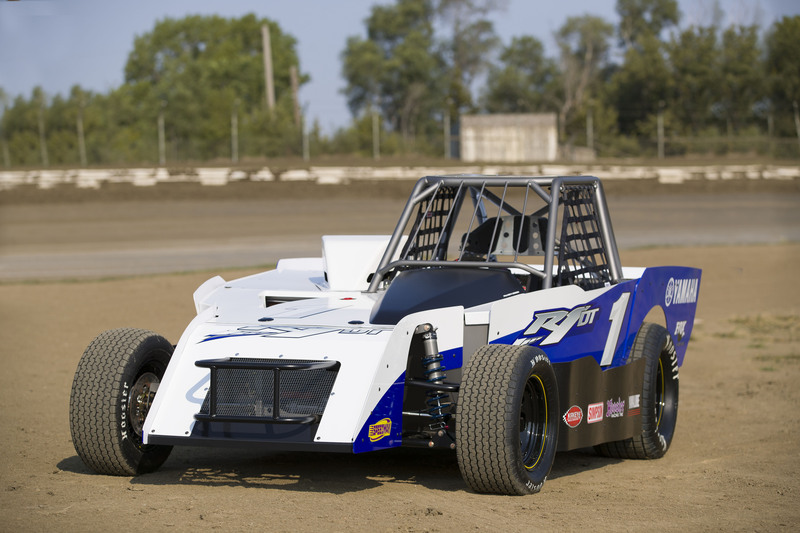 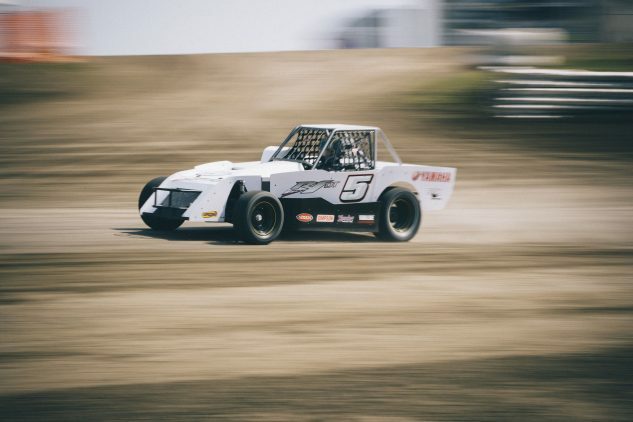 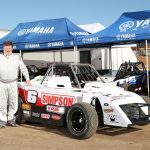 Kruseman said he was shifting the R1DT’s six-speed transmission 12 times per lap to maximize his speed, while Halbert told us he chose to leave his car in fourth gear. 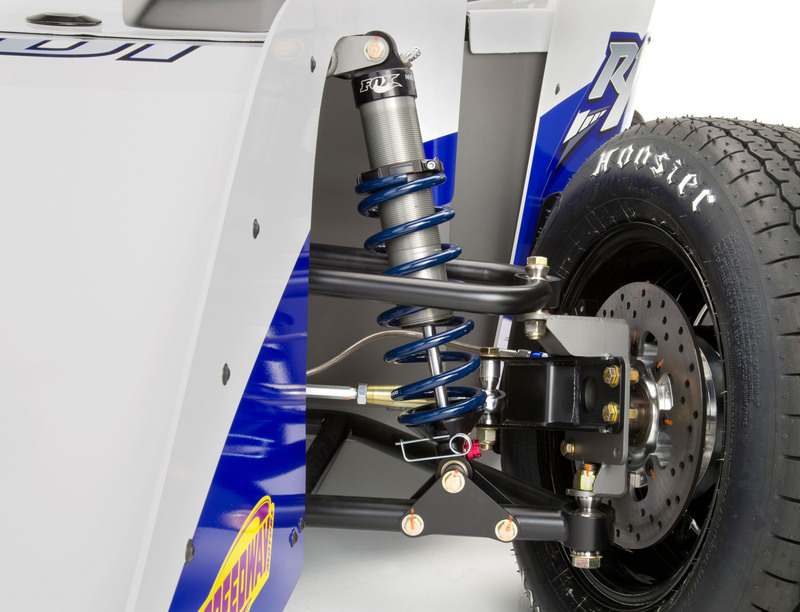 Regardless, hearing nearly every car hitting their rev limiters at the end of the front straightaway seemed to indicate the R1DT’s final-drive gearing should’ve been a bit taller for the track conditions. 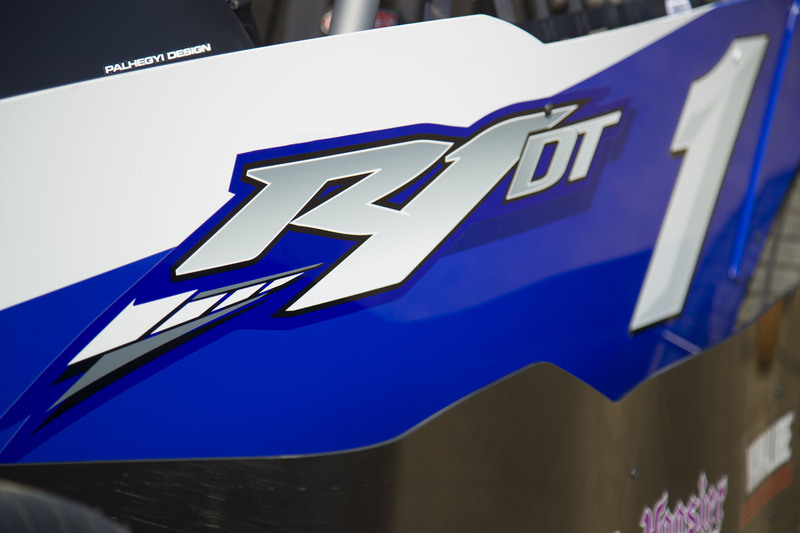 Although lacking the truly awesome speed of a 900-horsepower sprint car, the R1DT displayed a brisk pace and admirable handling qualities. 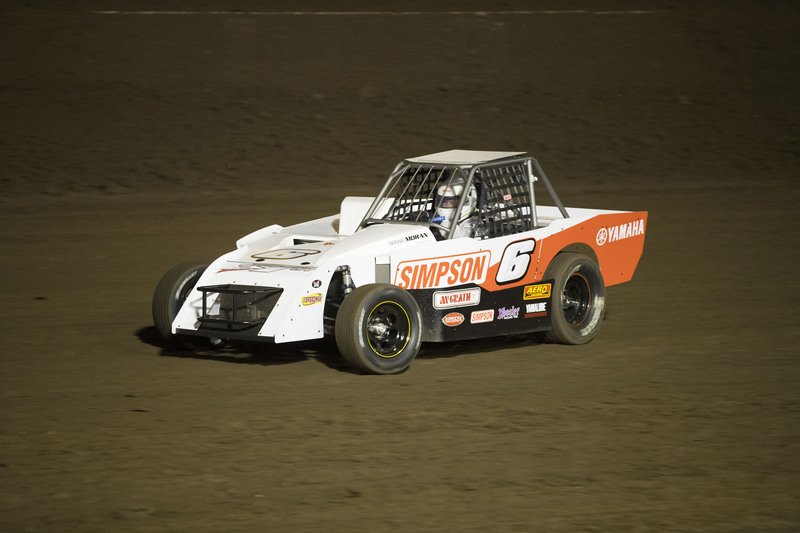 Nelson proved to be the fastest driver during the eight-lap heat race, but the grid would be inverted for the 20-lap feature race. 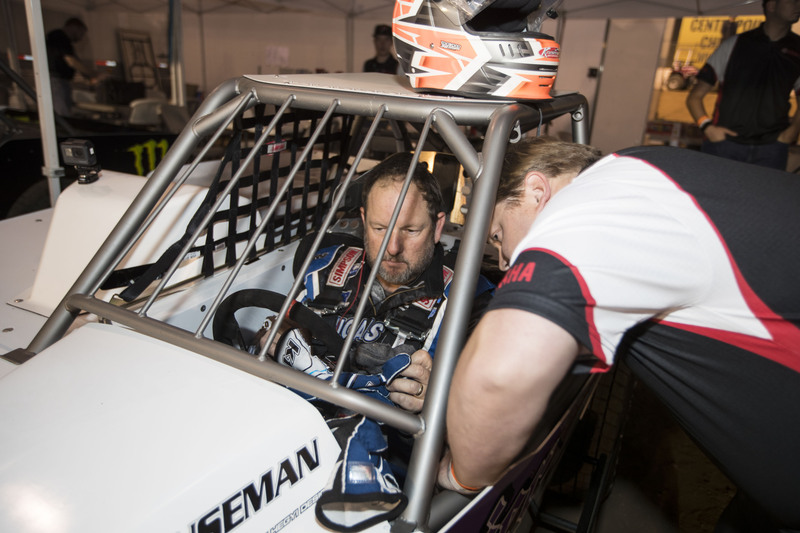 Unfortunately for Halbert, his car suffered a mechanical malady and wasn’t able to compete in the main event. 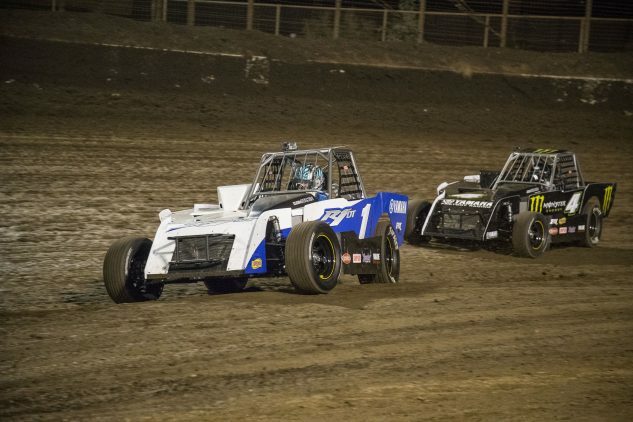 Nelson quickly worked his way up to the front of the field but then tangled with leader Gushi, causing both to spin and bringing out a yellow flag. 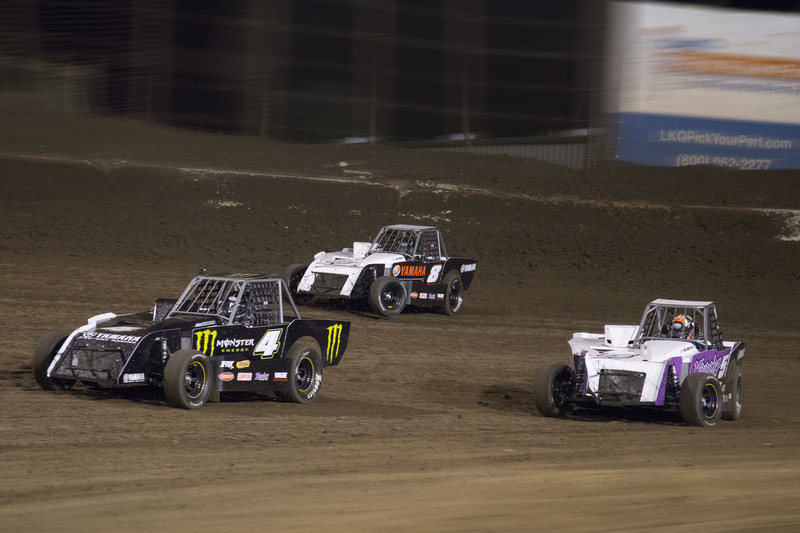 Greaves assumed control of the race at the restart and went on to score the win, followed by Moran and Decker. 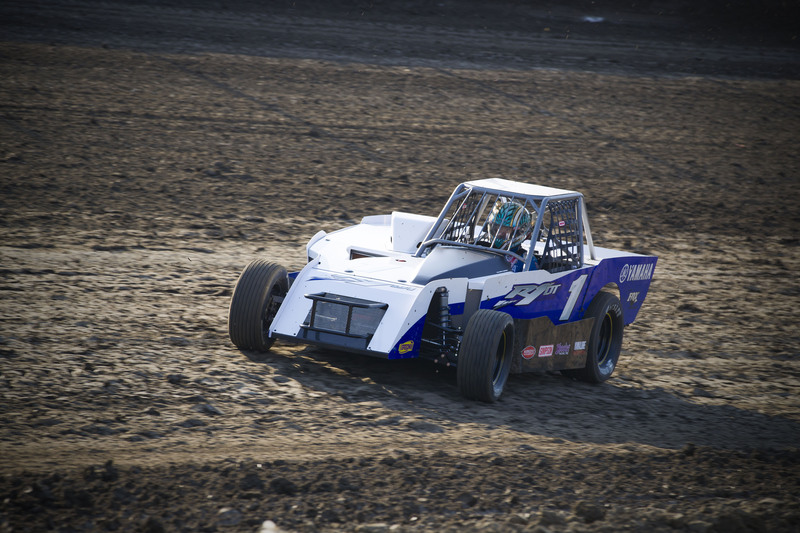 Hayes, one of the fastest drivers on track, got a little too exuberant and spun twice in the race. 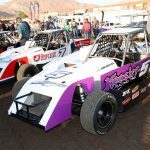 Motorcycle racers Dustin Nelson (1) and Josh Hayes (4) were among the fastest R1DT drivers at Perris, but both had problems in the 20-lap main event that kept them out of the winner’s circle. 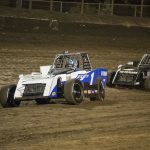 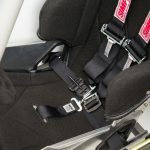 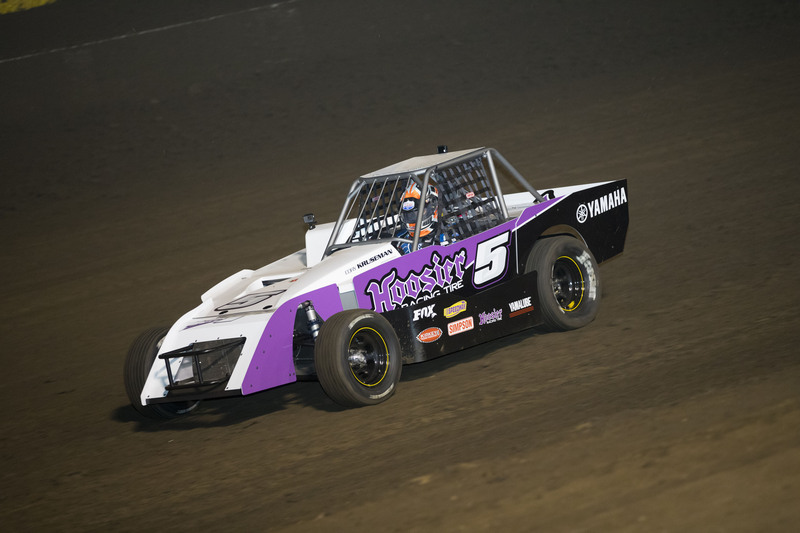 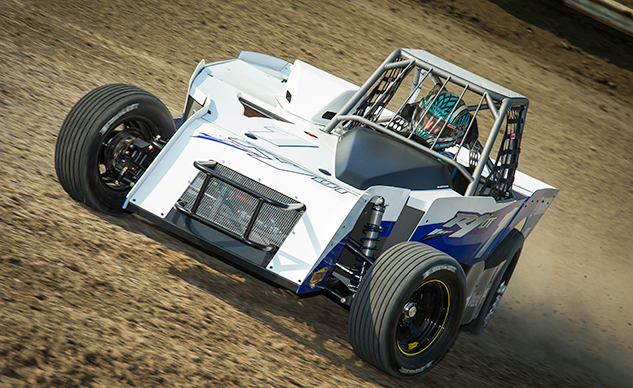 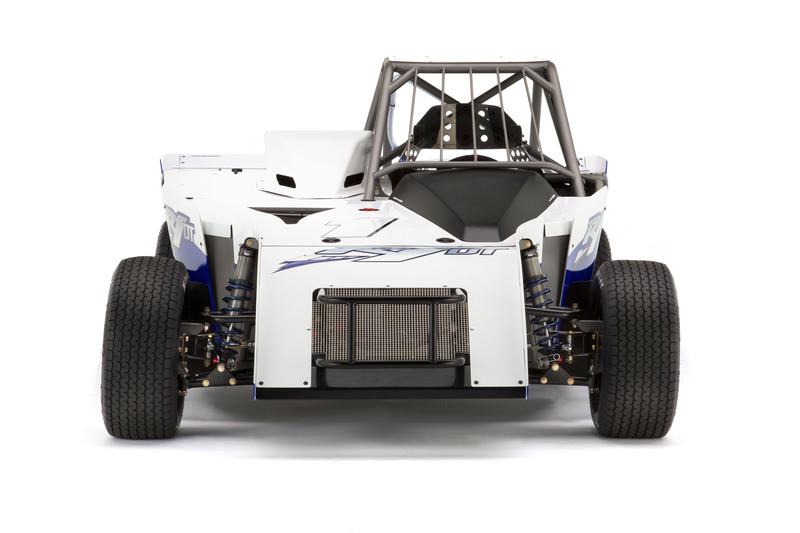 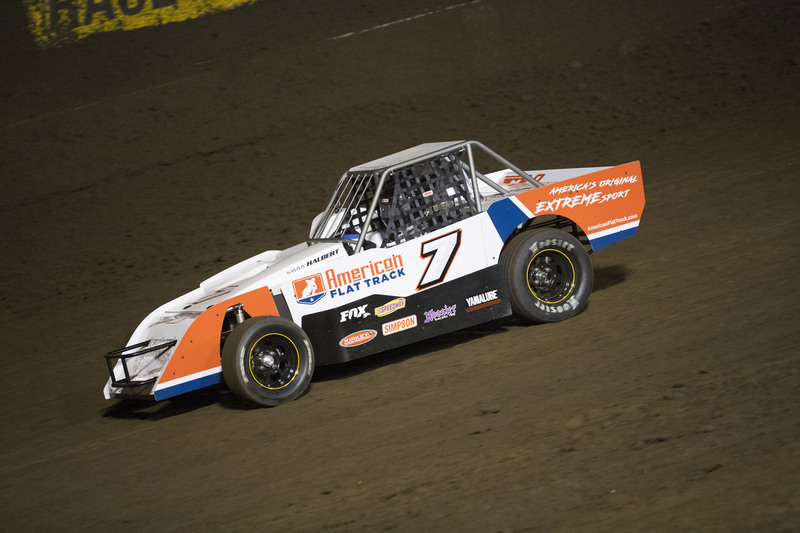 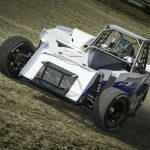 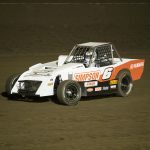 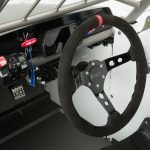 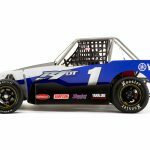 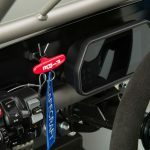 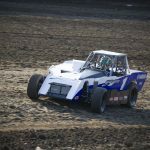 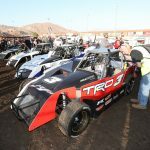 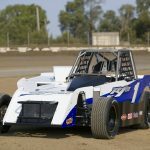 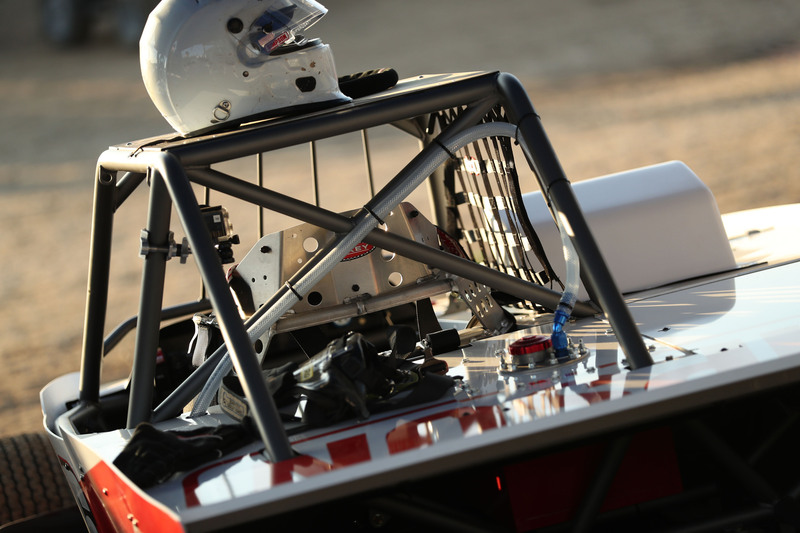 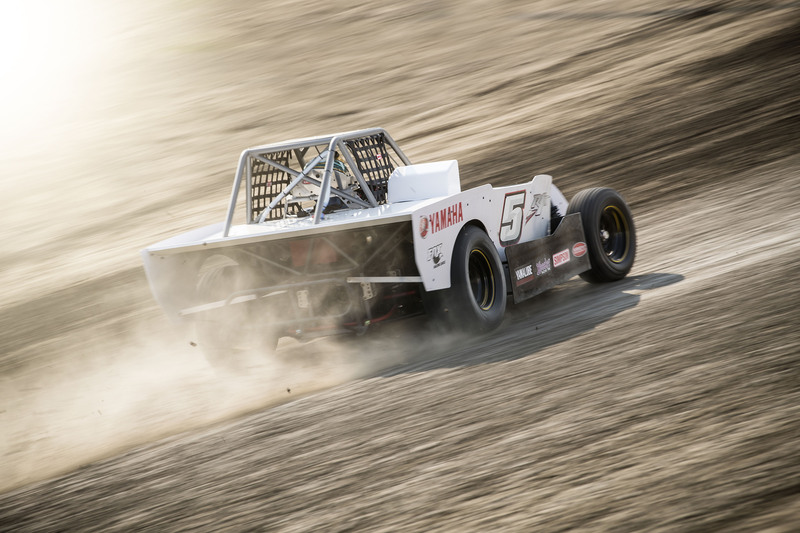 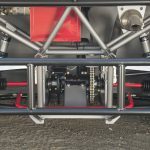 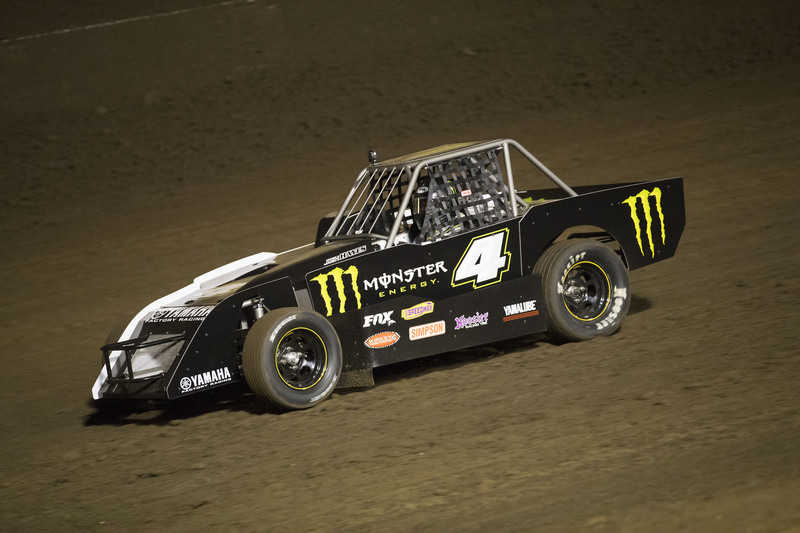 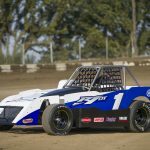 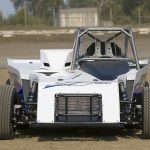 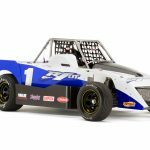 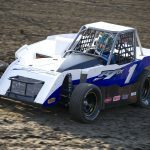 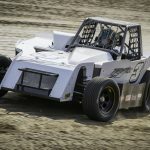 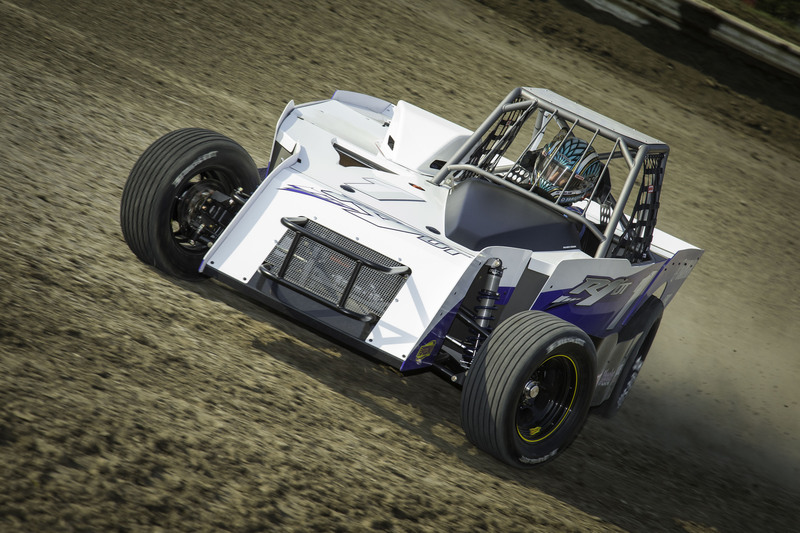 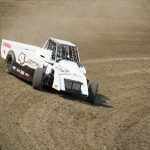 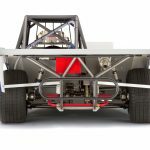 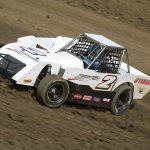 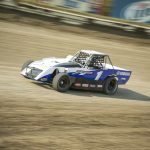 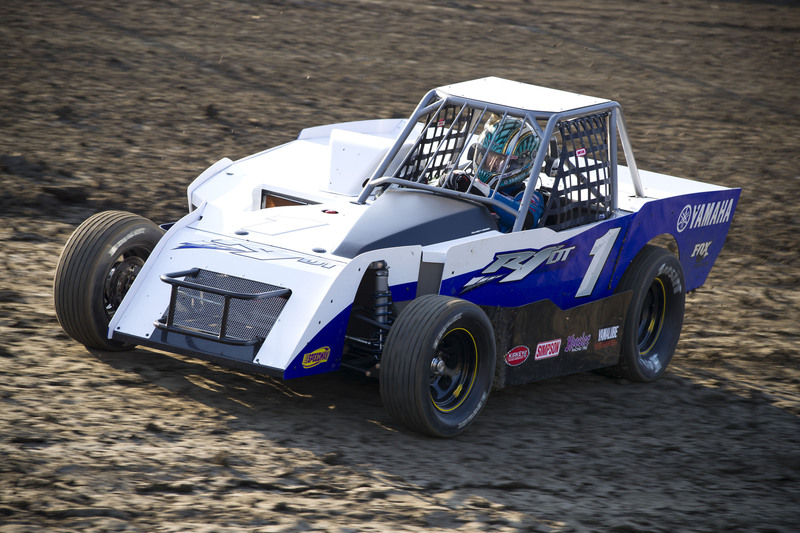 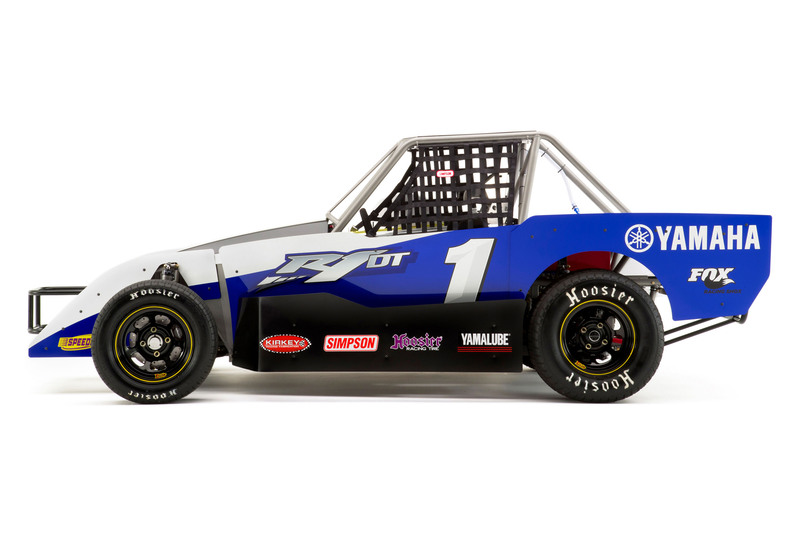 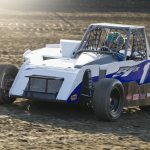 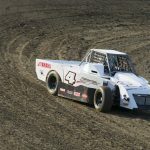 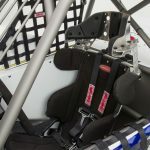 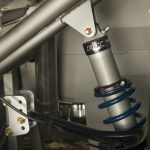 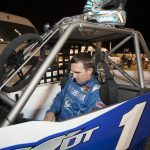 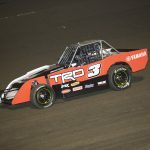 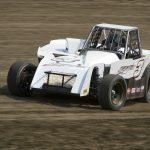 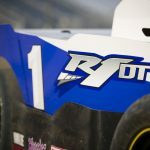 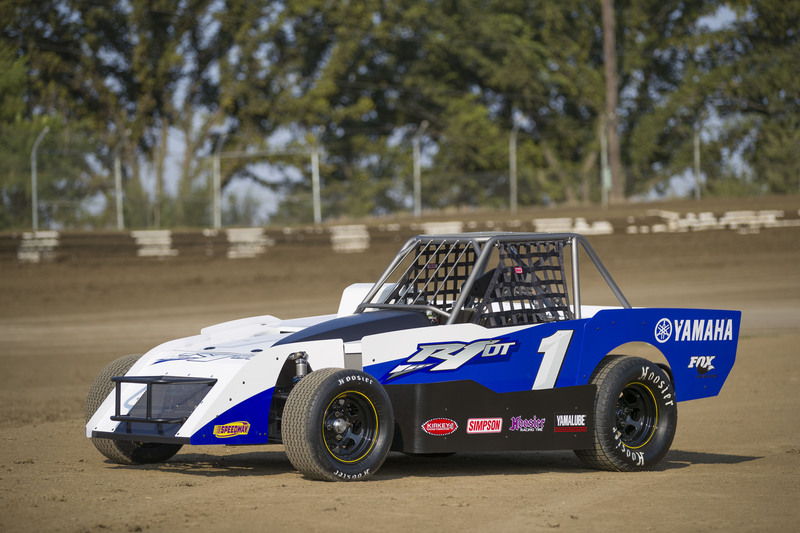 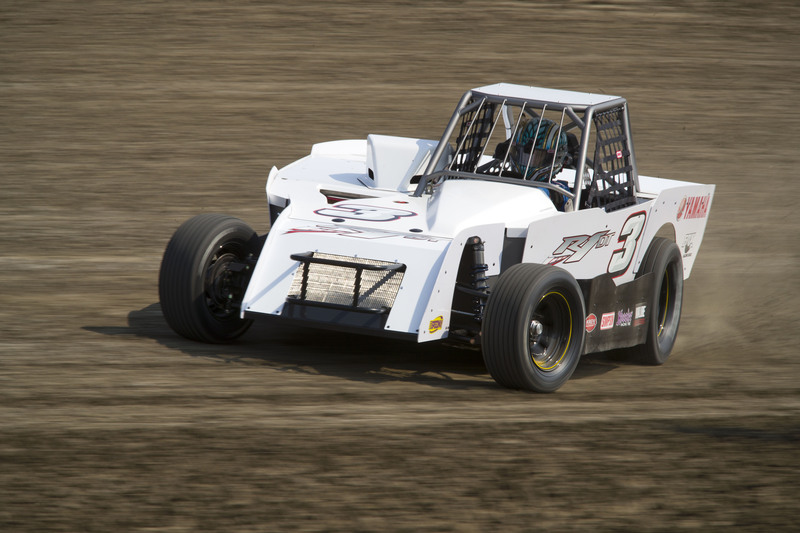 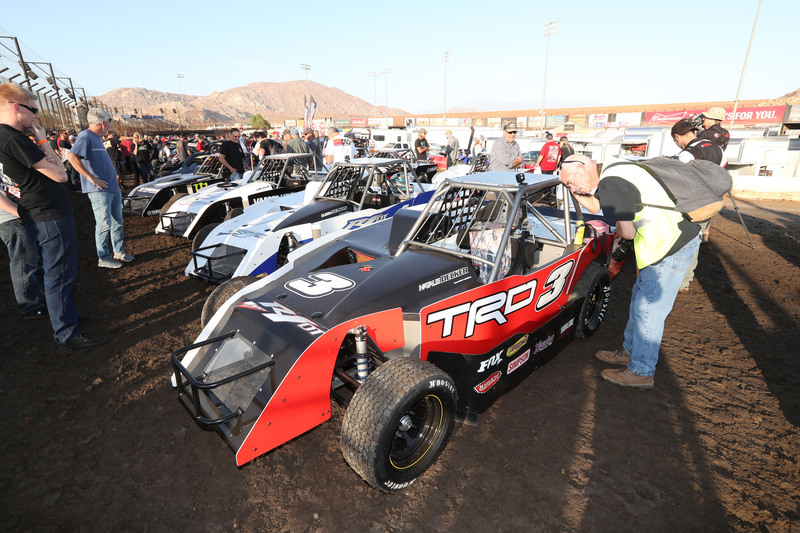 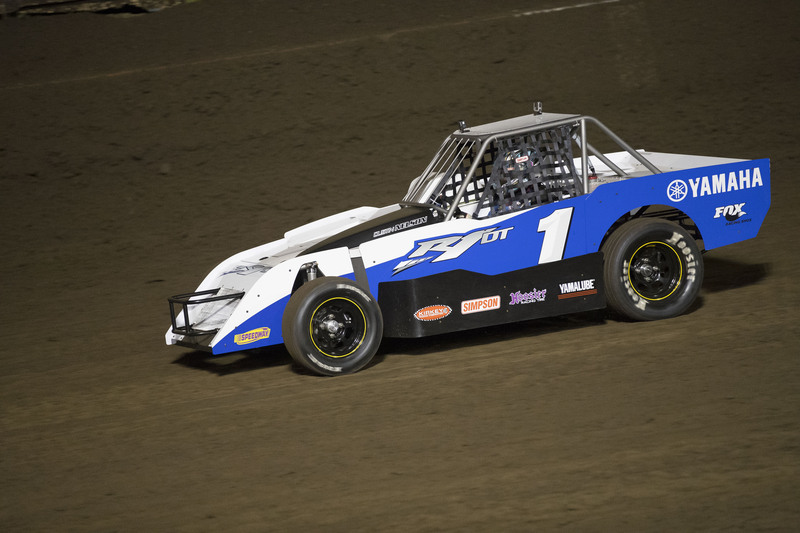 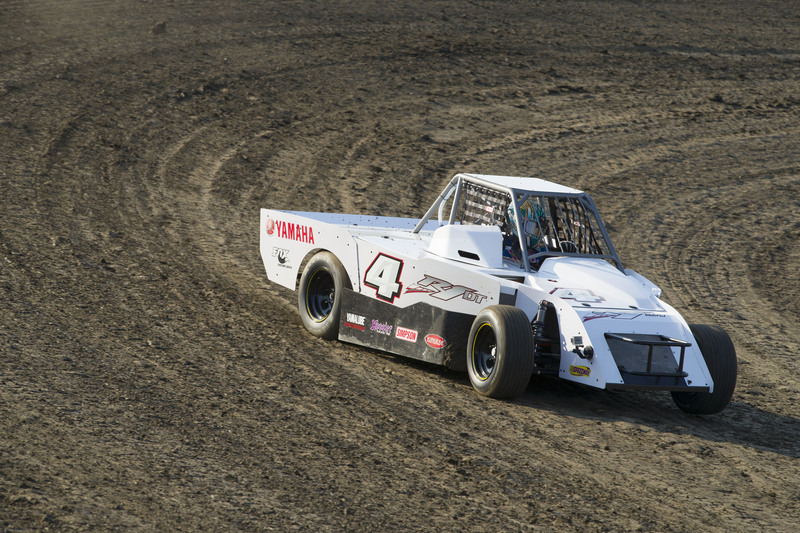 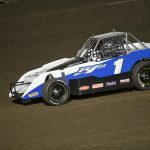 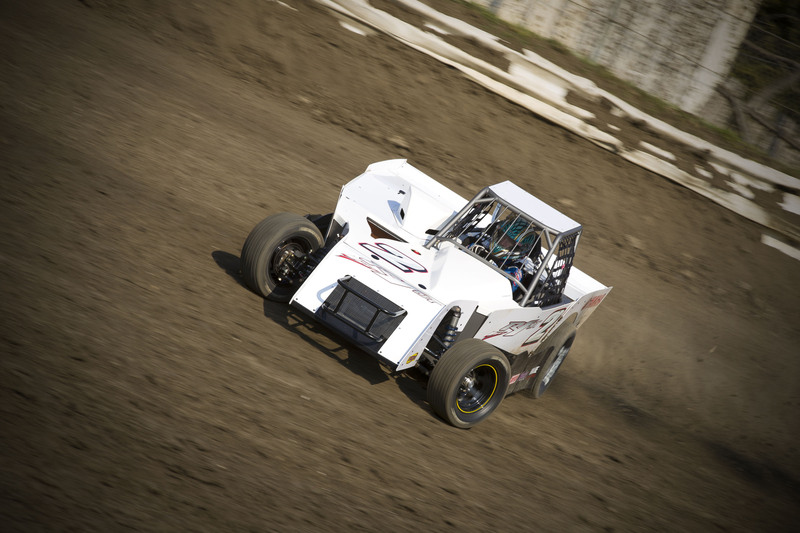 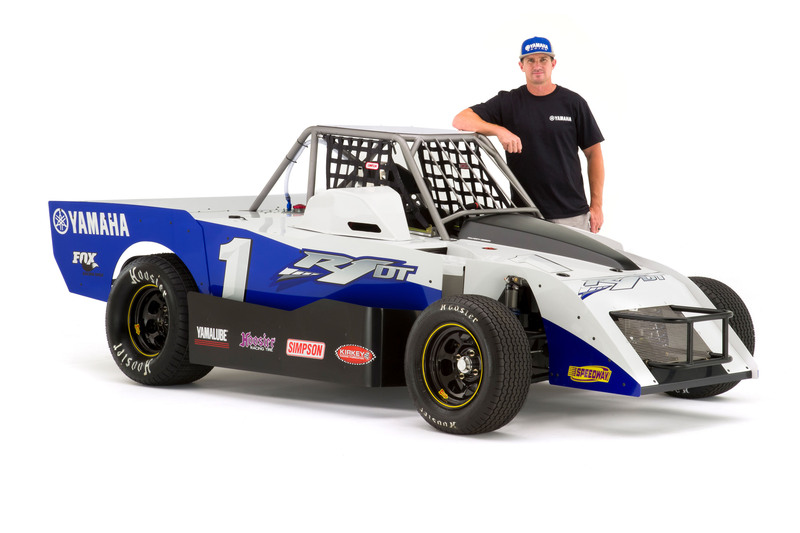 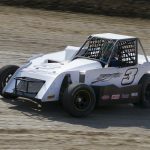 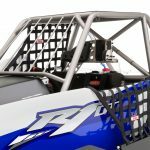 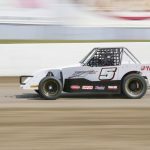 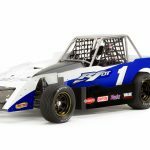 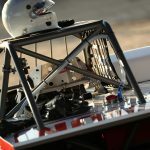 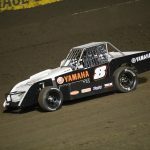 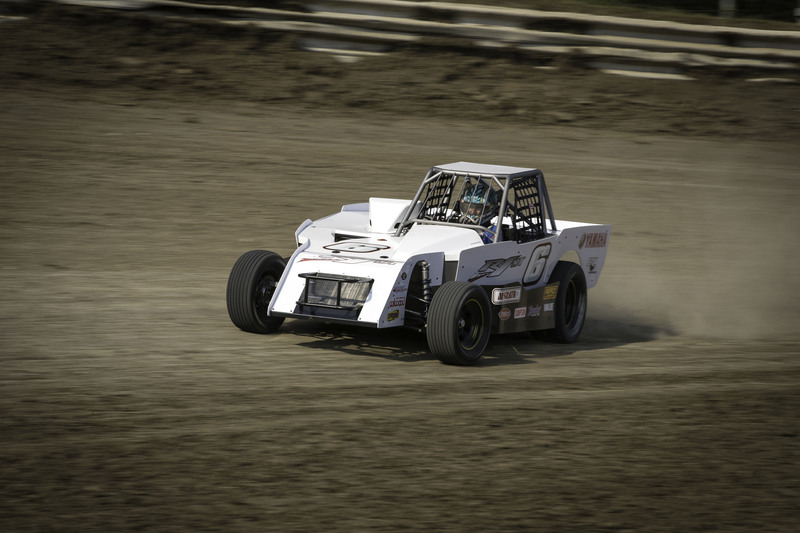 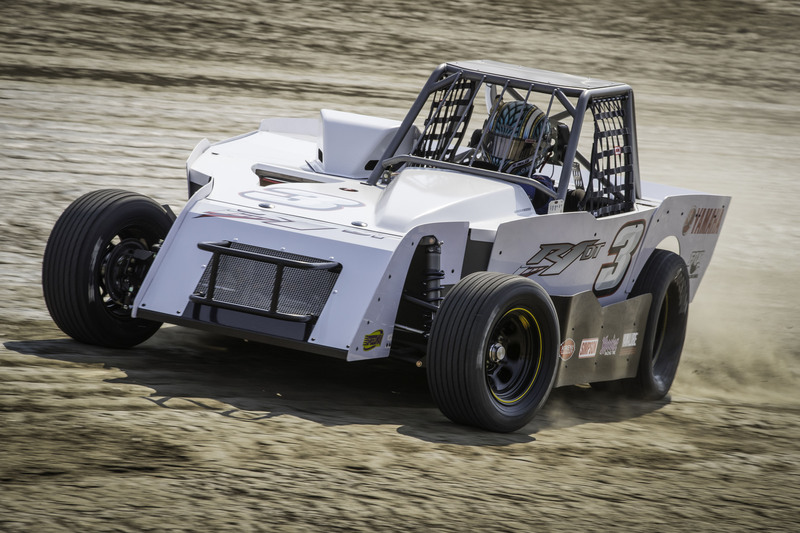 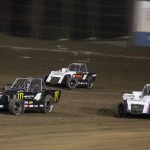 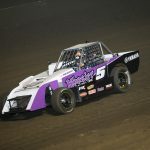 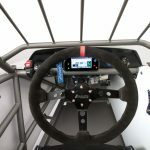 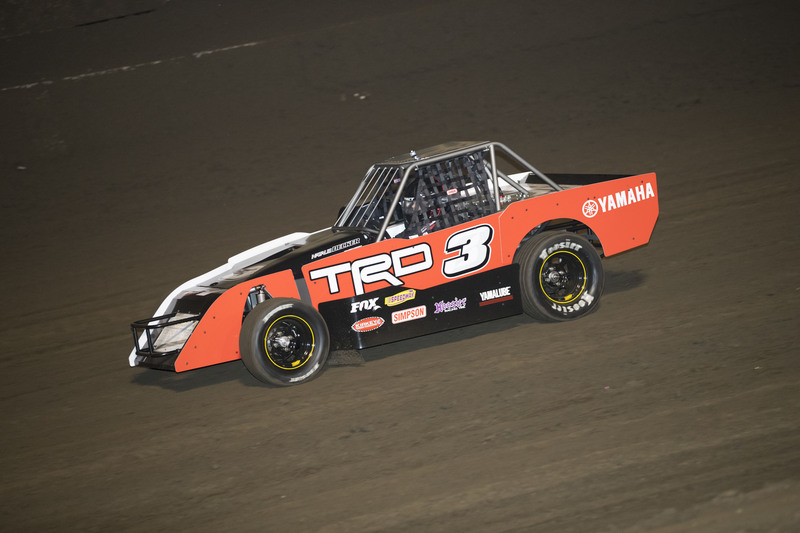 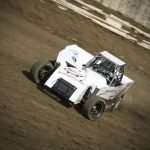 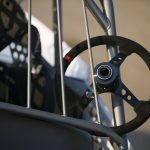 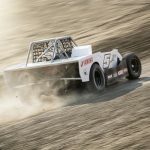 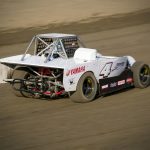 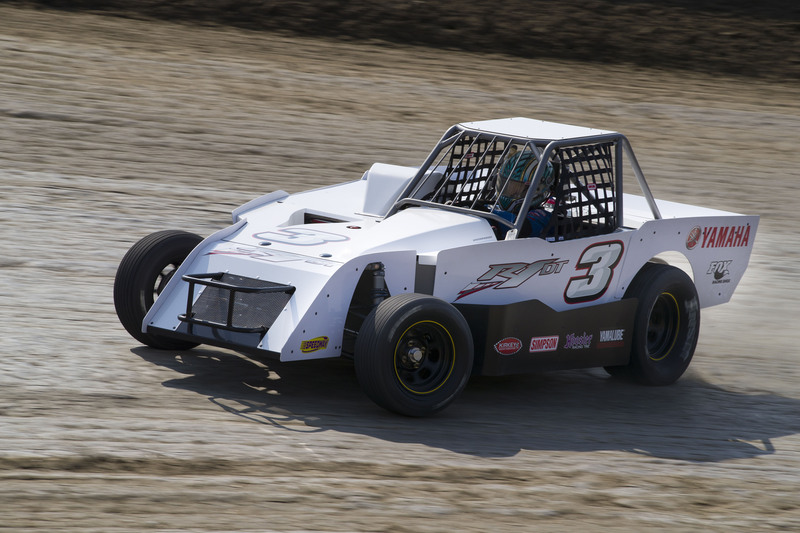 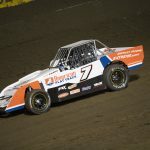 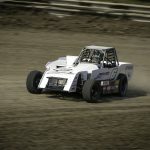 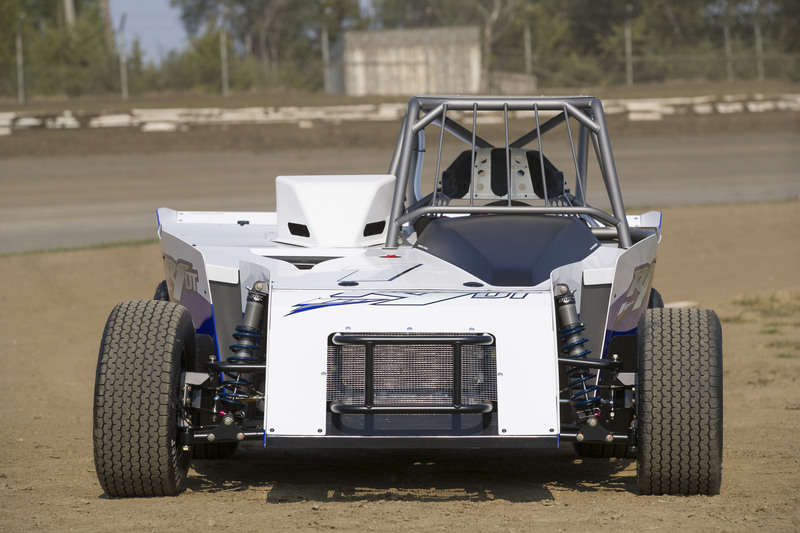 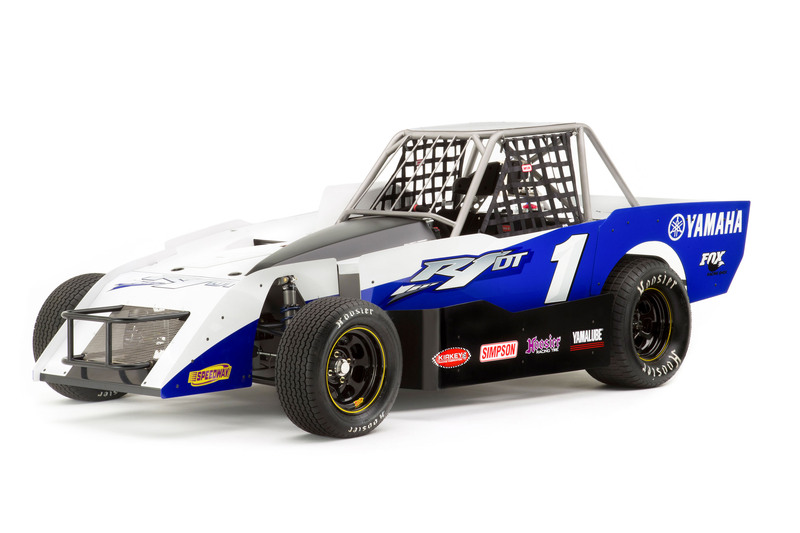 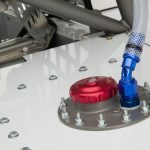 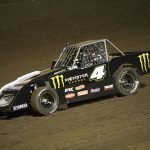 Decker’s third-place finish demonstrated the the R1DT’s driver-friendly nature, as she had been unable to participate in any of the practice sessions leading up to the Perris event and admitted to having minimal dirt experience. 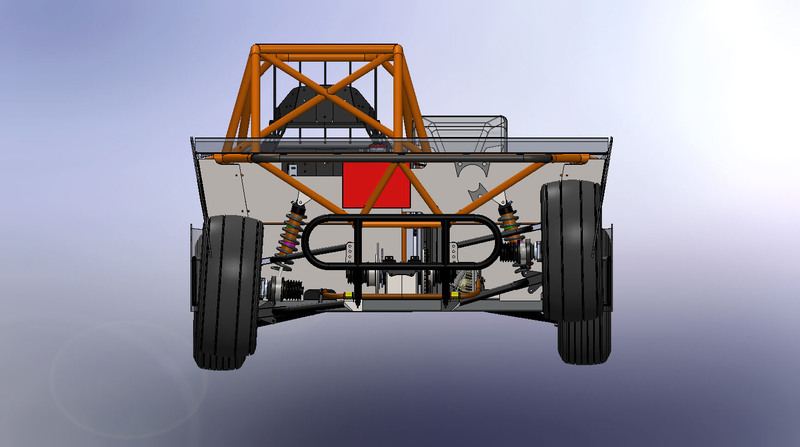 As for the future of the R1DT project, that’s still a bit up in the air. 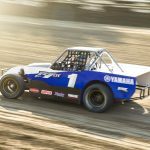 Yamaha didn’t indicate how much it would cost if it was put into production, but dirt-track insiders estimate it might need to be priced in the neighborhood of $25,000. 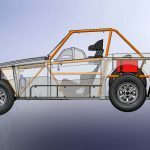 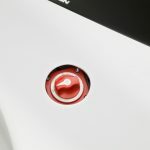 If the project came to fruition, Yamaha would sell the car through select dealerships and provide parts through its dealer network. 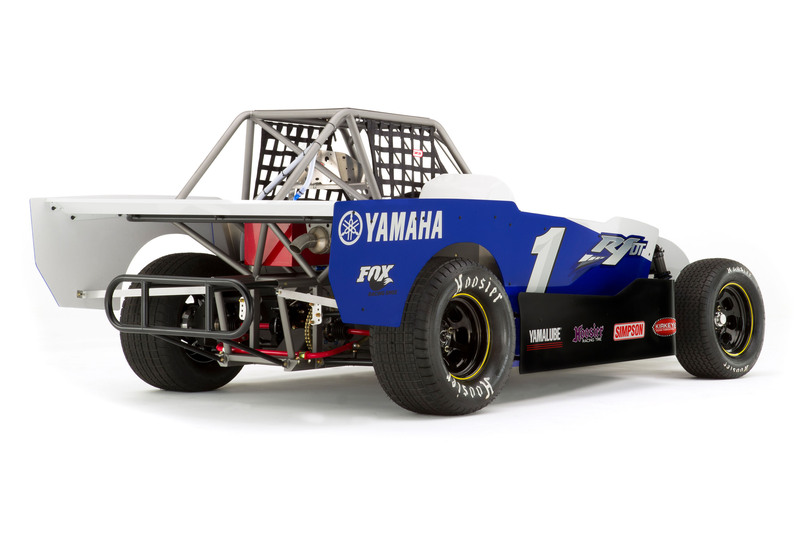 After seeing the R1DT in wheel-to-wheel action, we hope this is just the beginning of an inspired concept from Yamaha. 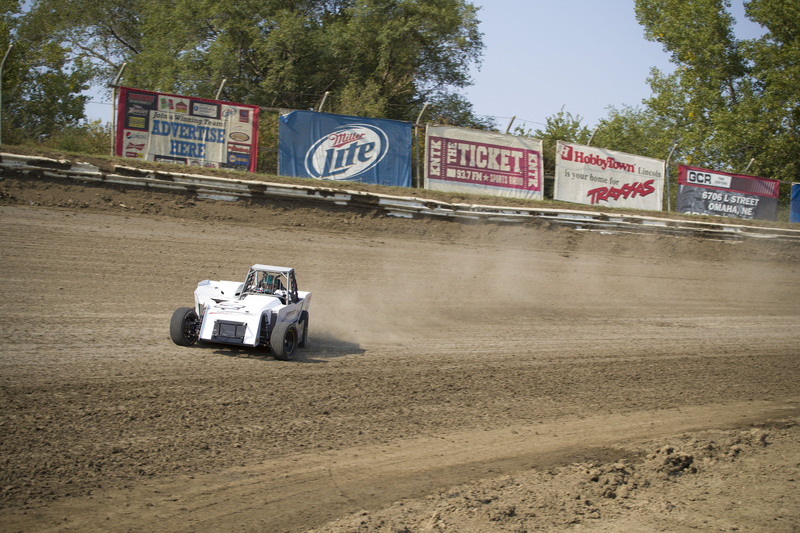 The cars look to be seriously fun to drive, and we’re salivating for the opportunity to experience it for ourselves!